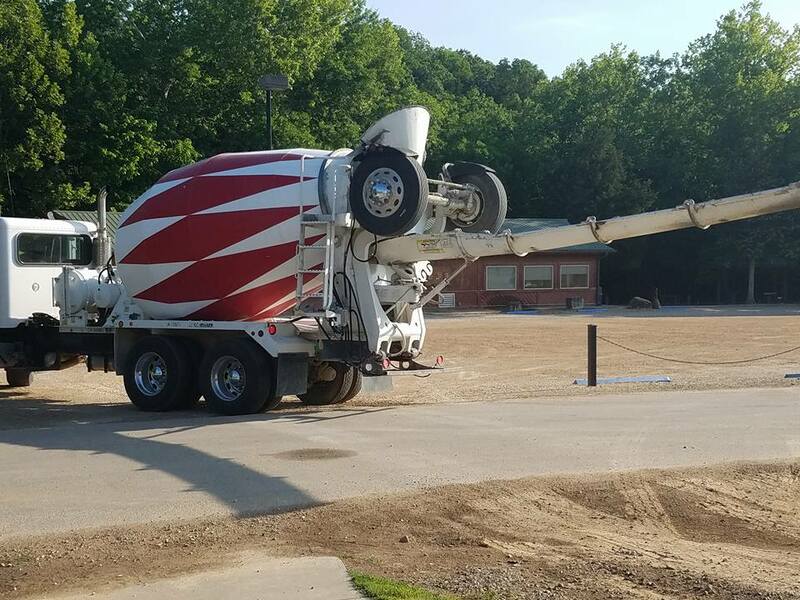 Concrete trucks are here today! 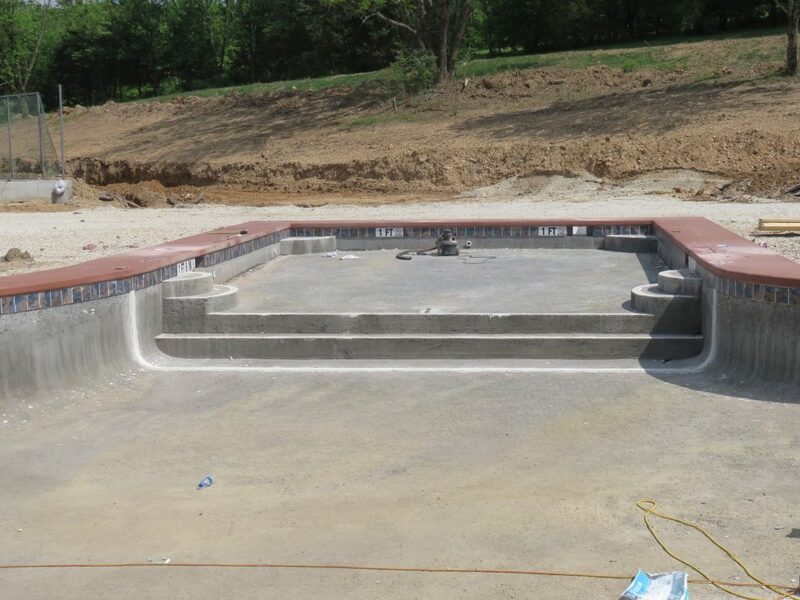 It's so pretty full. 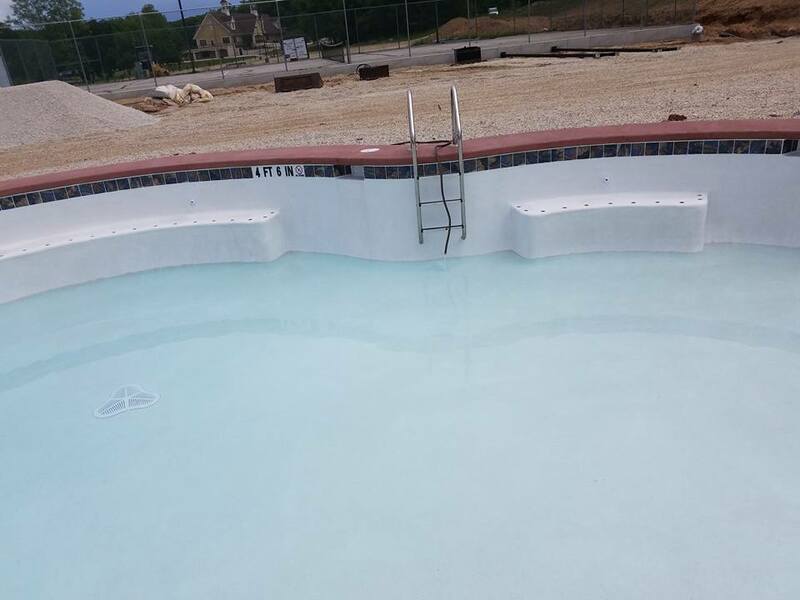 We already have our first swimmer! 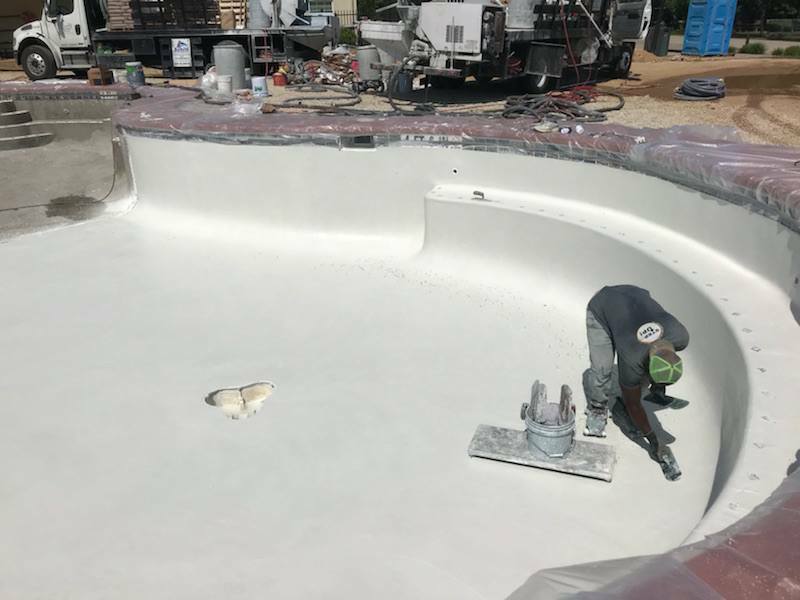 Plaster is finished. 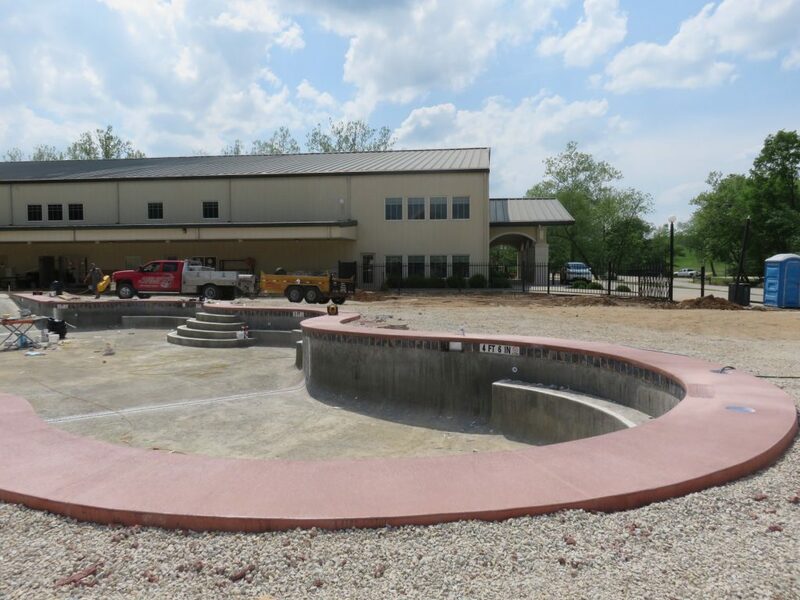 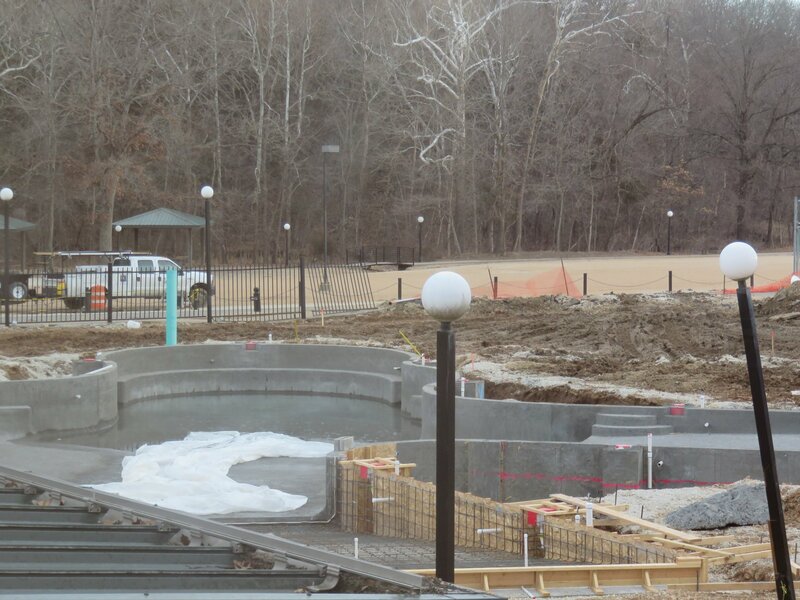 The water feature has been installed and we are filling it up with water! 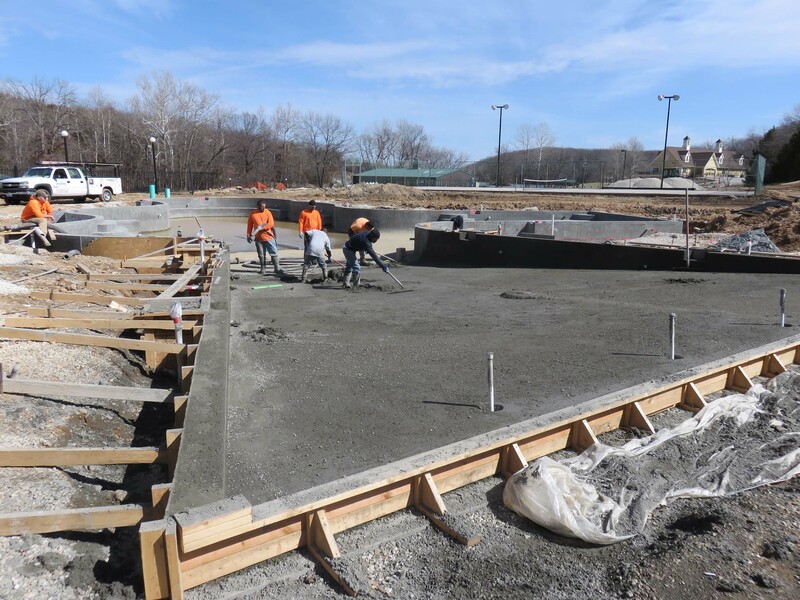 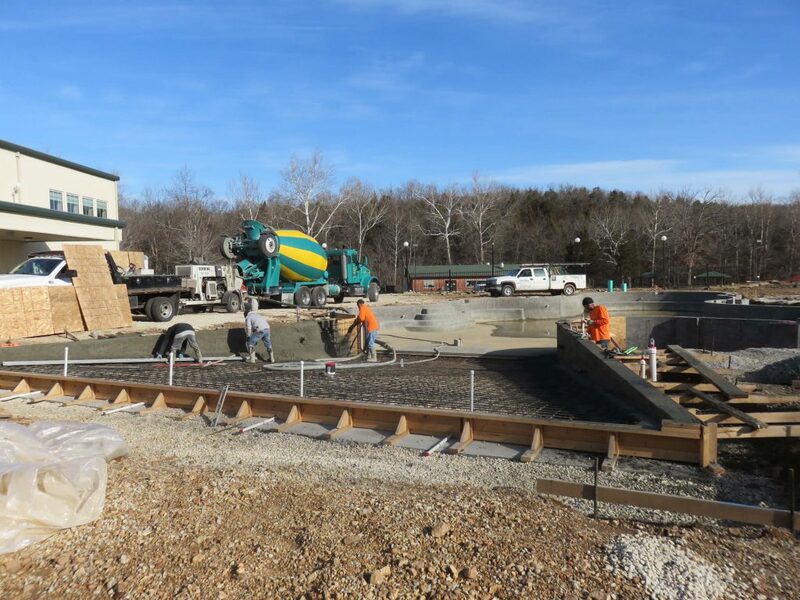 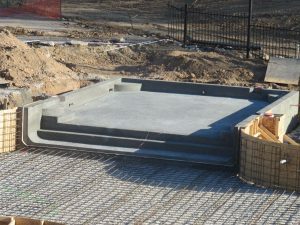 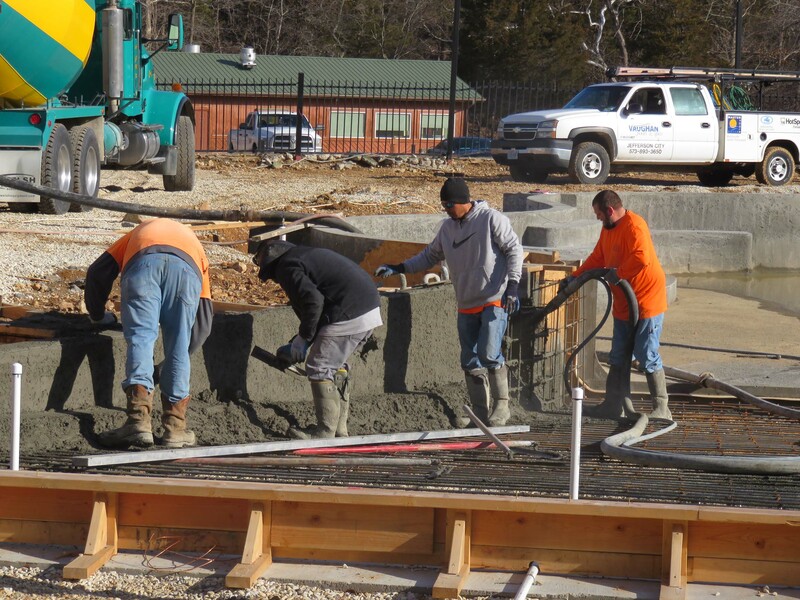 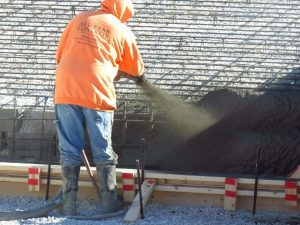 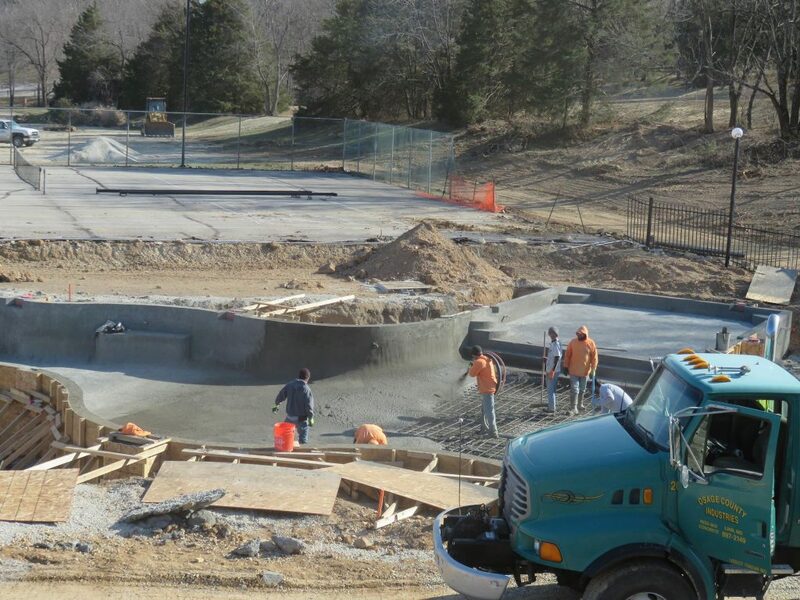 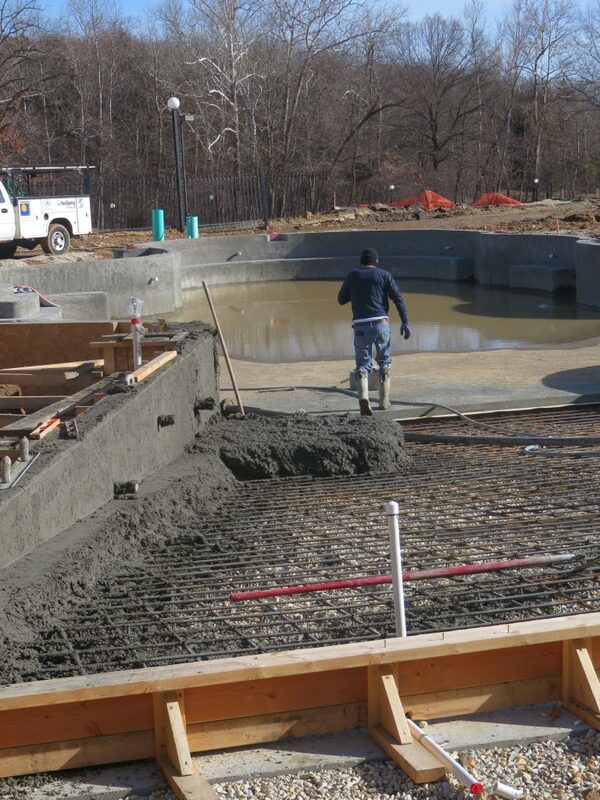 Weather permitting next week we will pour more concrete! 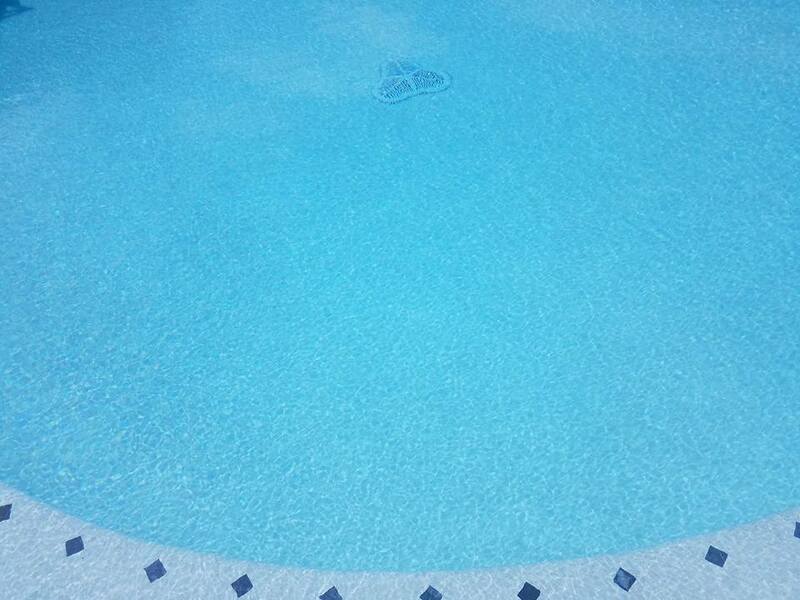 The sun is shining! 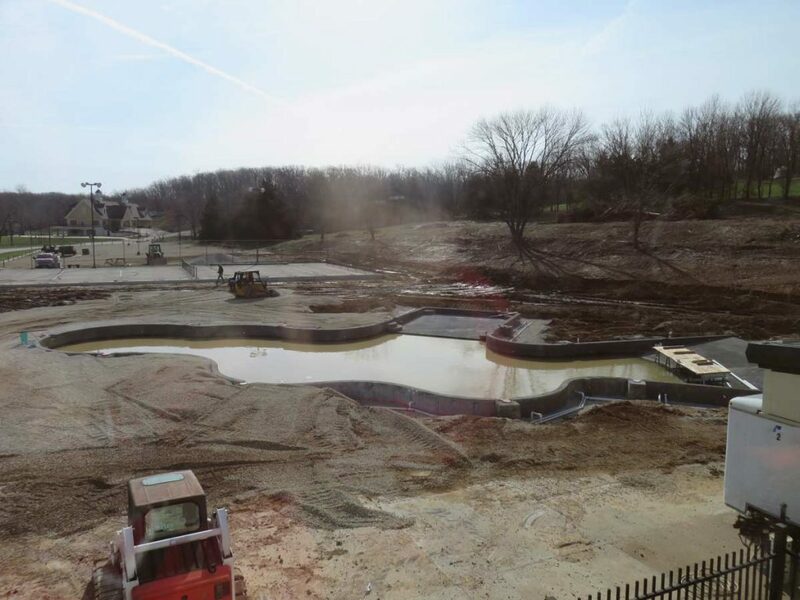 We can see it reflected in all the mud puddles.. 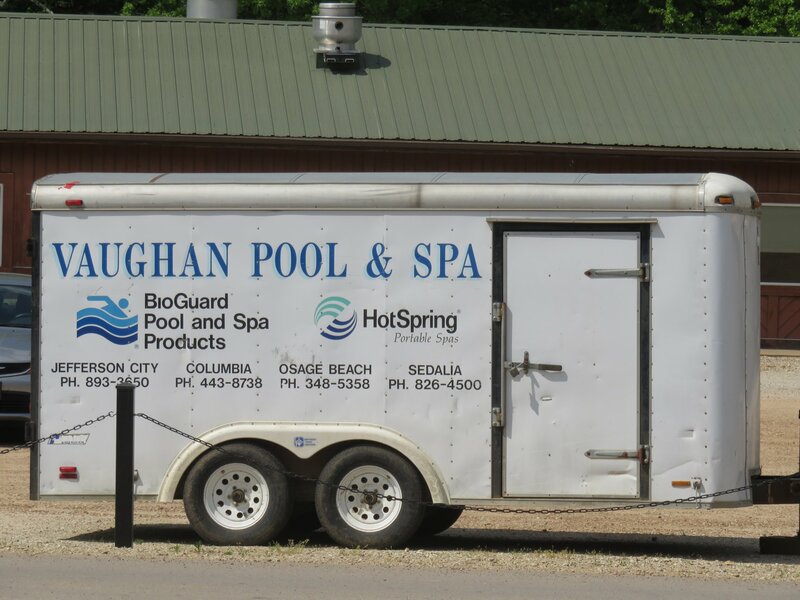 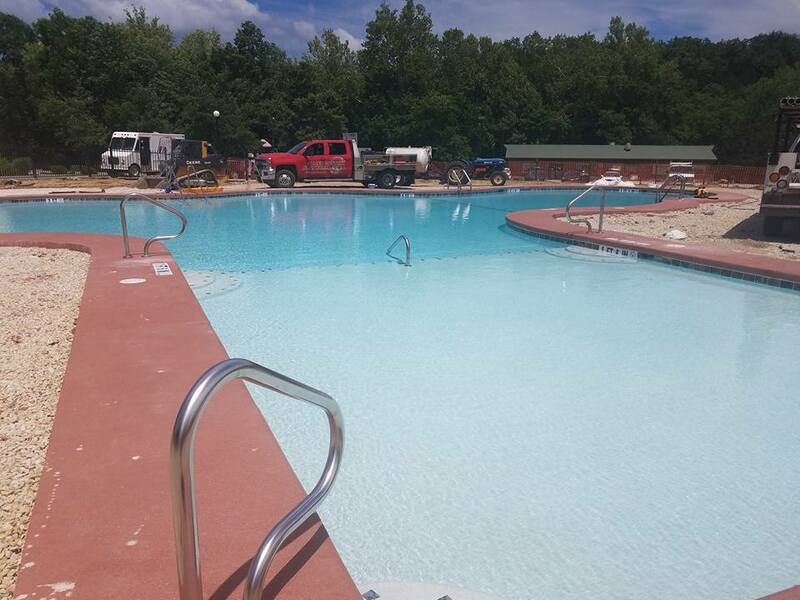 But everyone is working at the pool today. 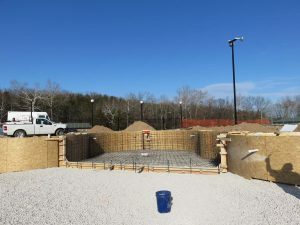 Got a peek inside the pump house!! 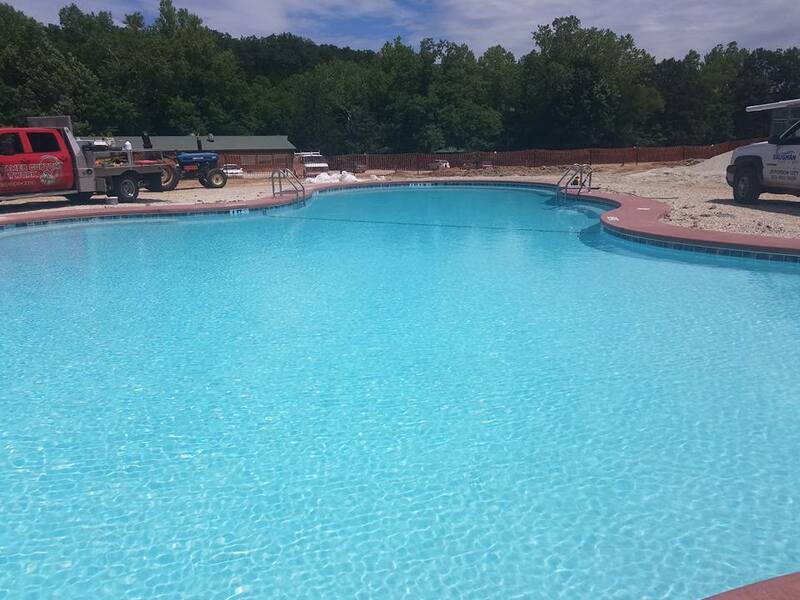 The pool will not be open for Memorial Weekend, however, we do have other activities planned! 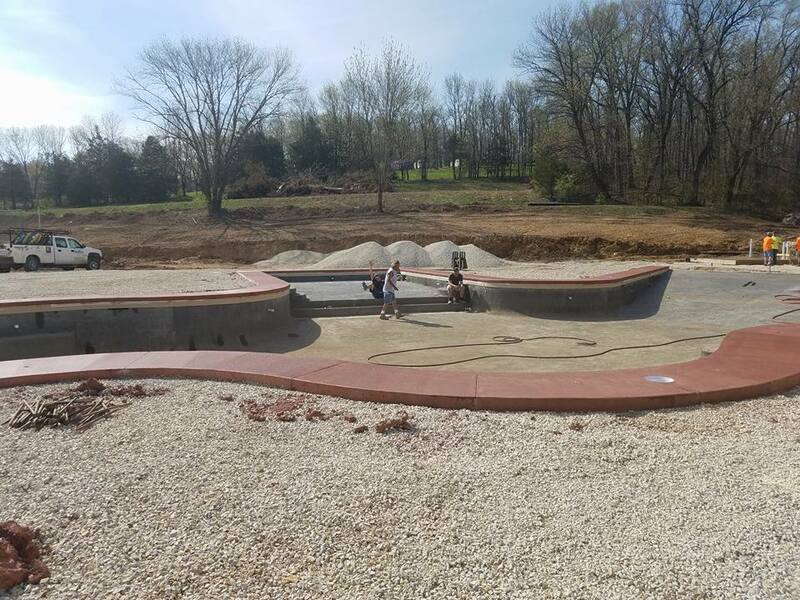 Spring has sprung and everyone involved is kill’in it to get it ready for Memorial Day opening!! 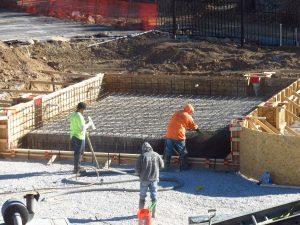 Concrete patio decking in process this week. 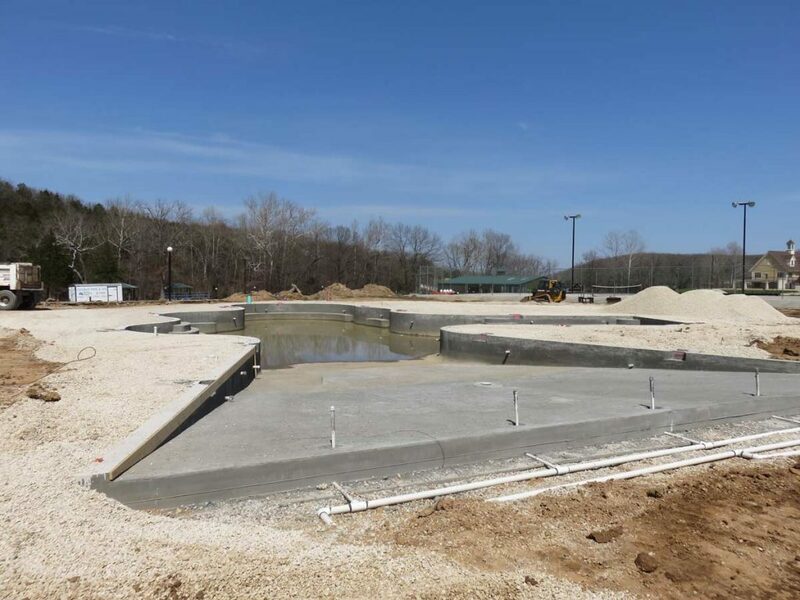 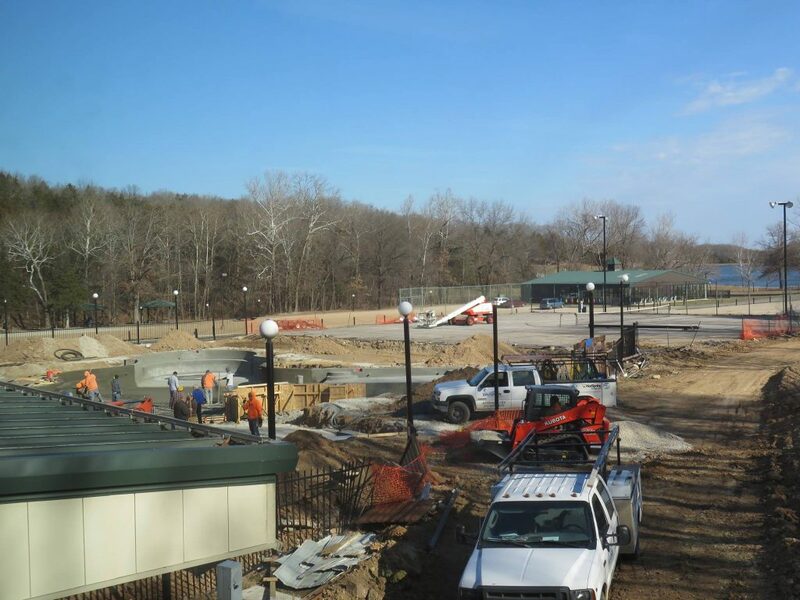 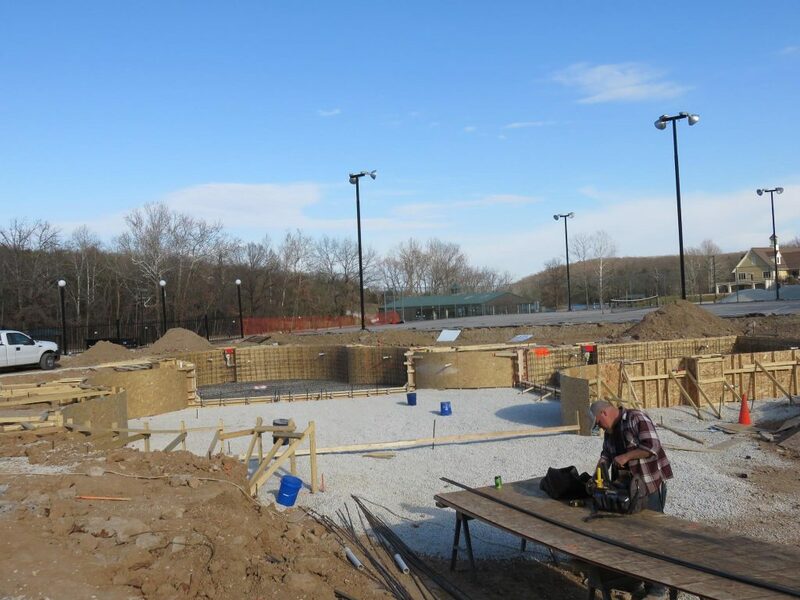 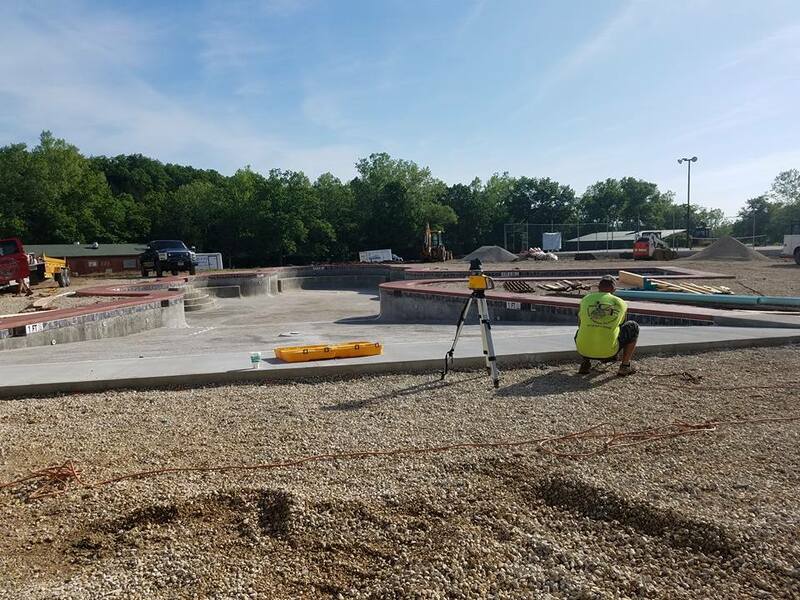 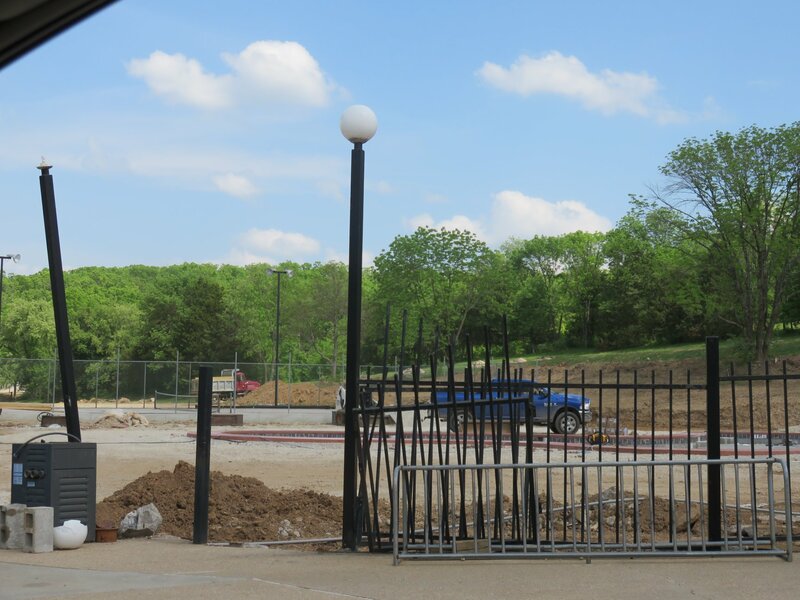 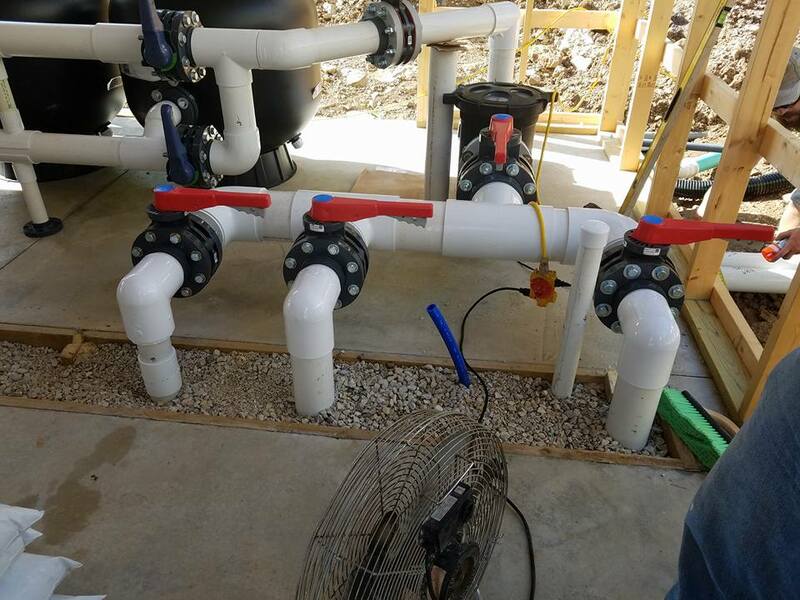 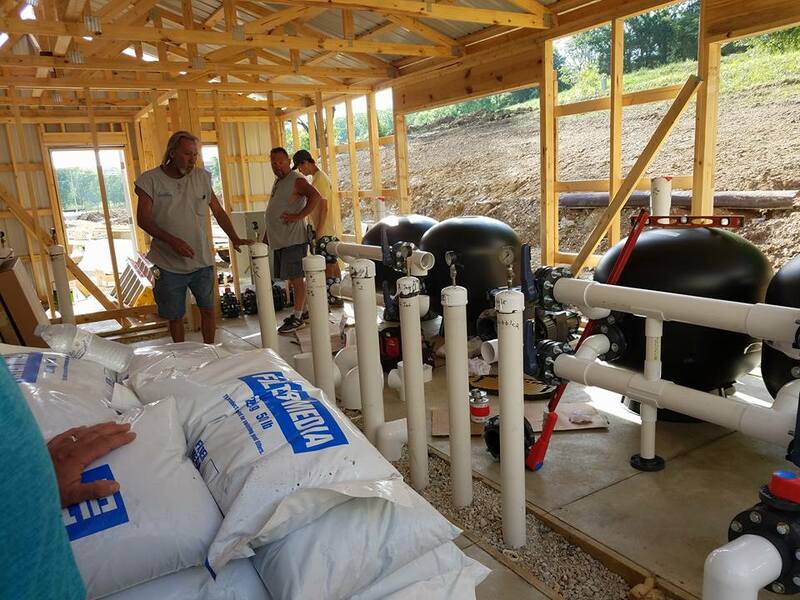 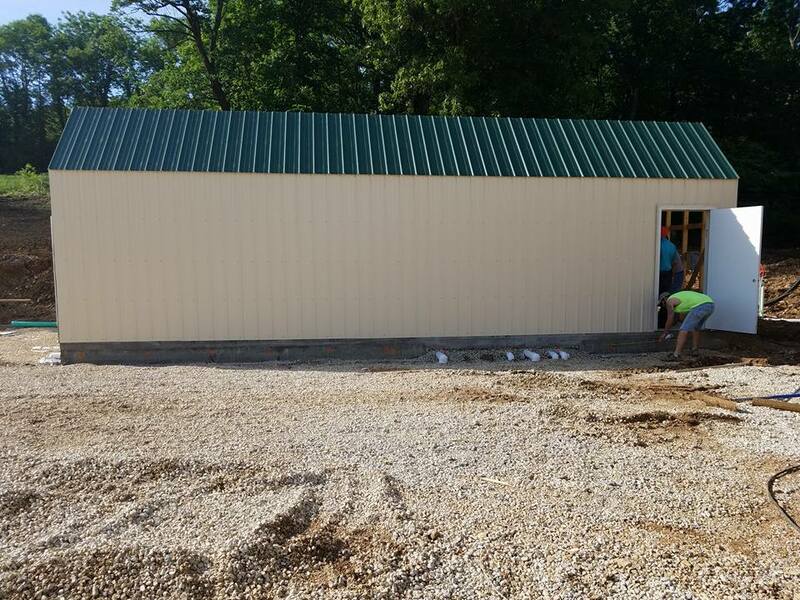 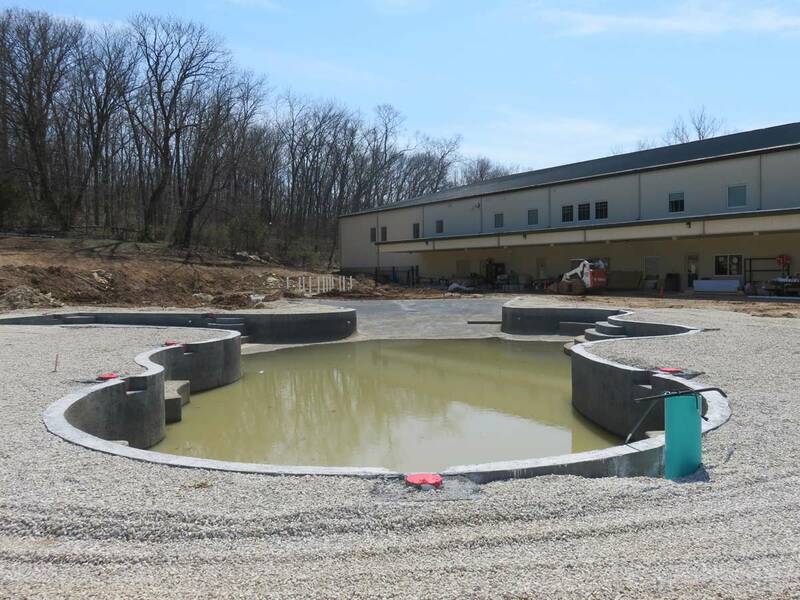 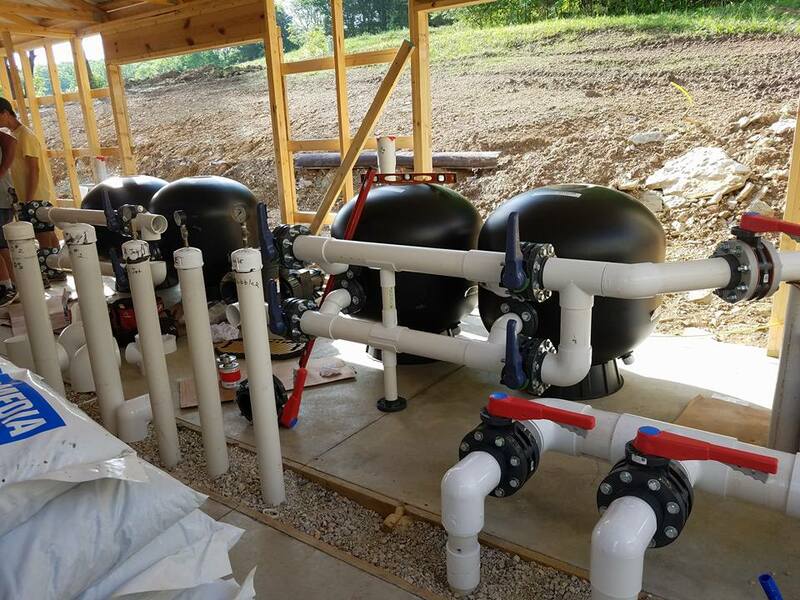 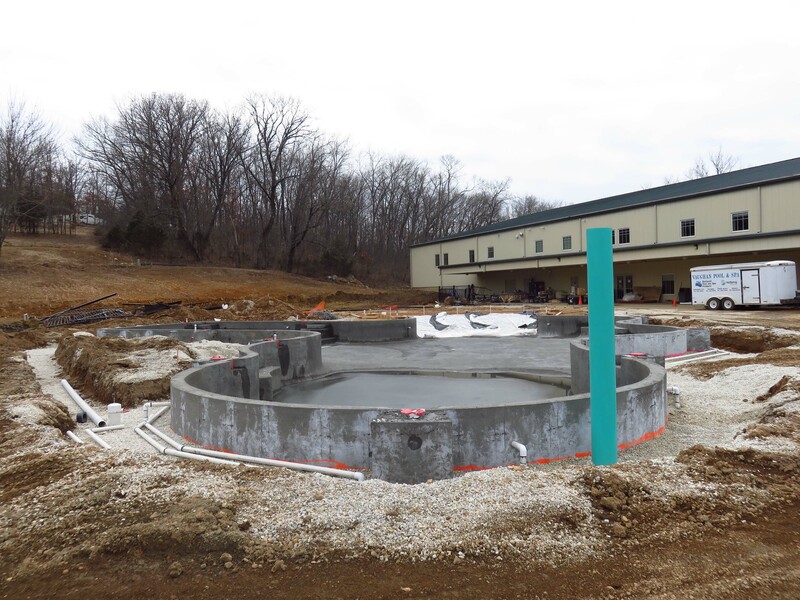 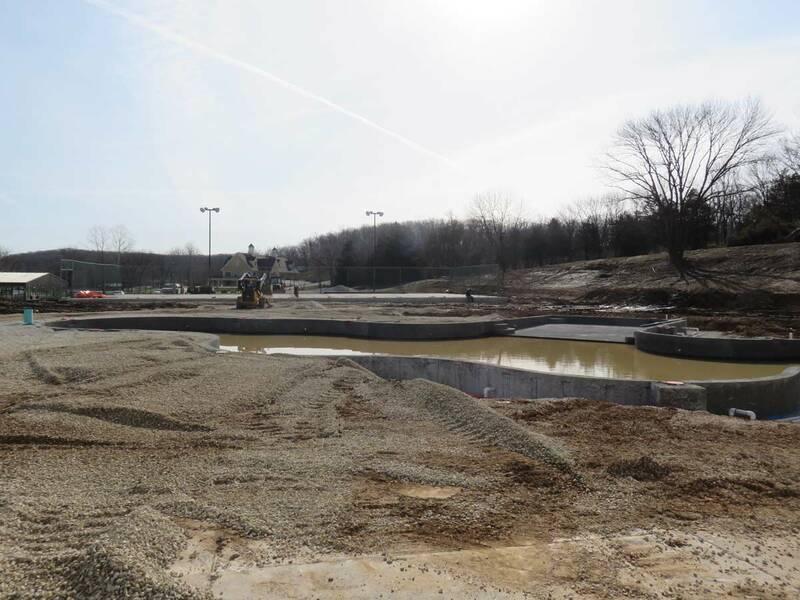 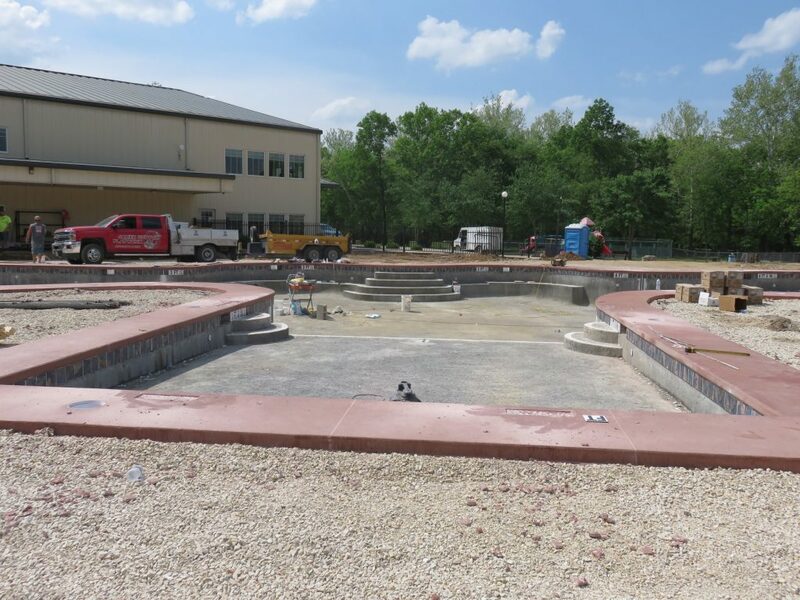 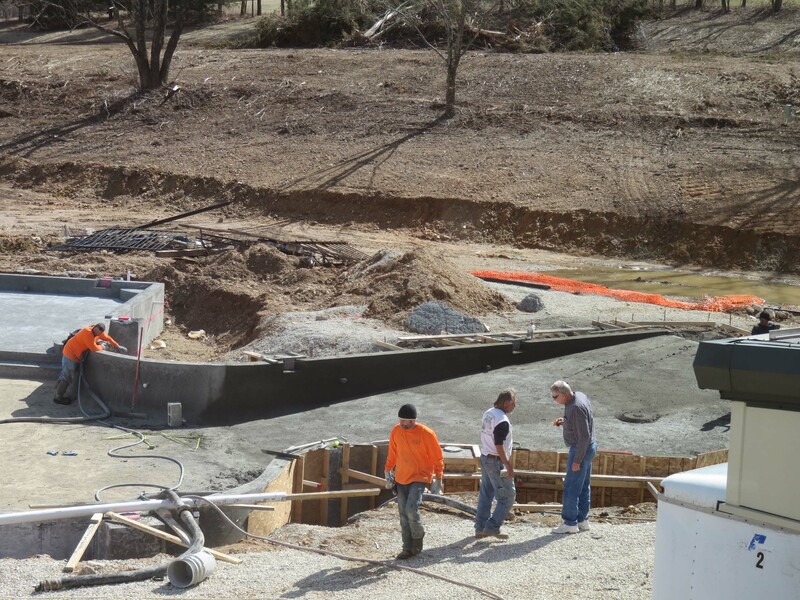 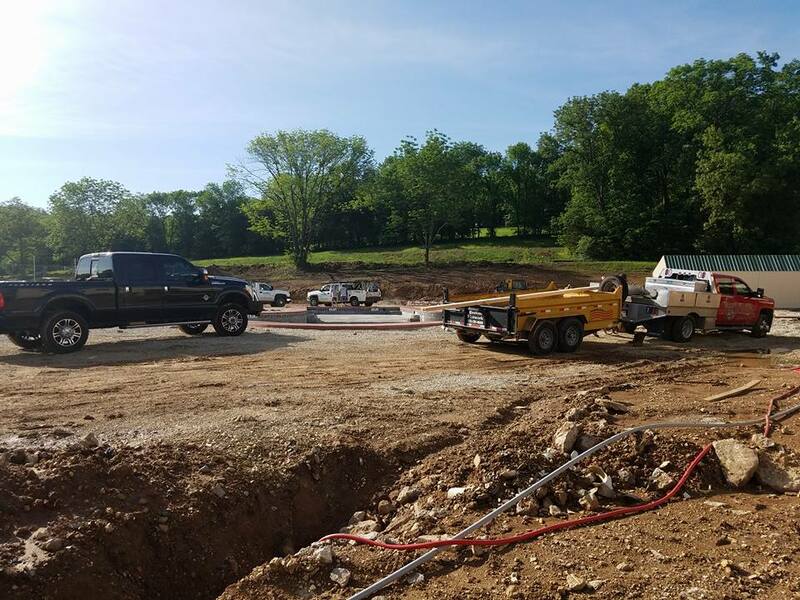 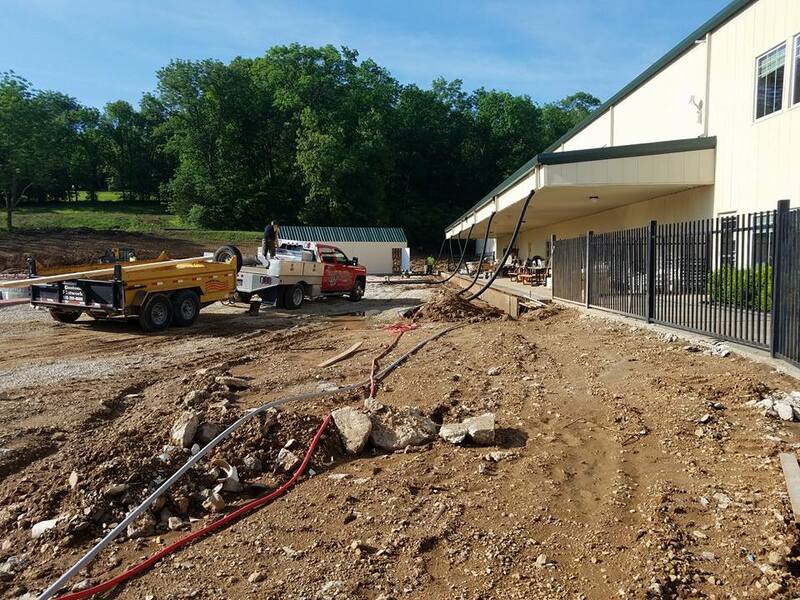 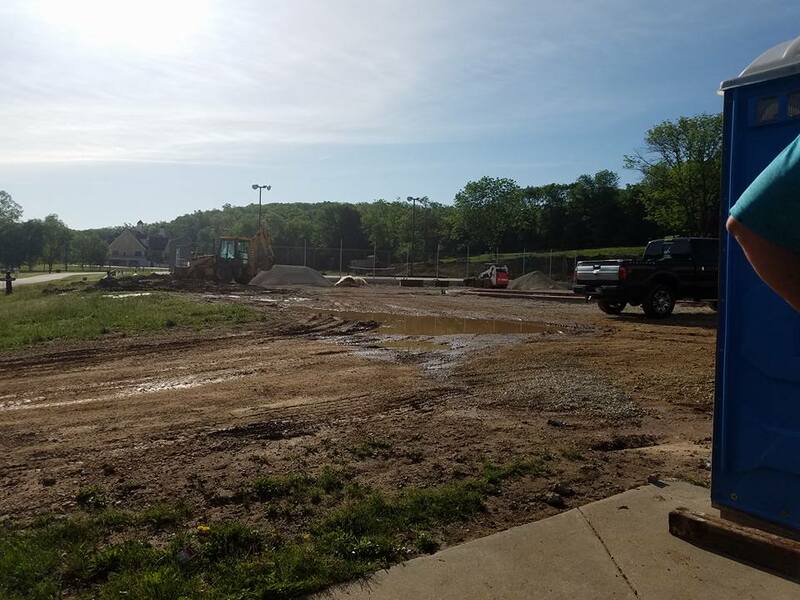 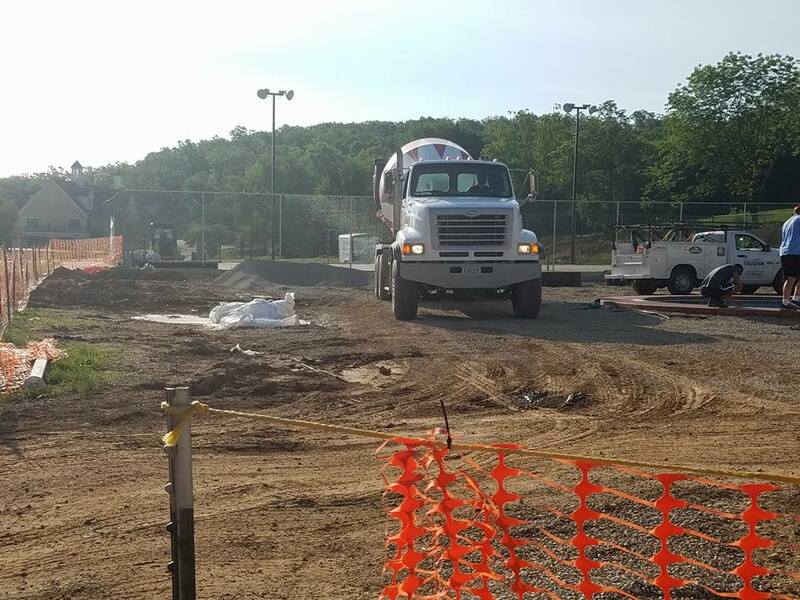 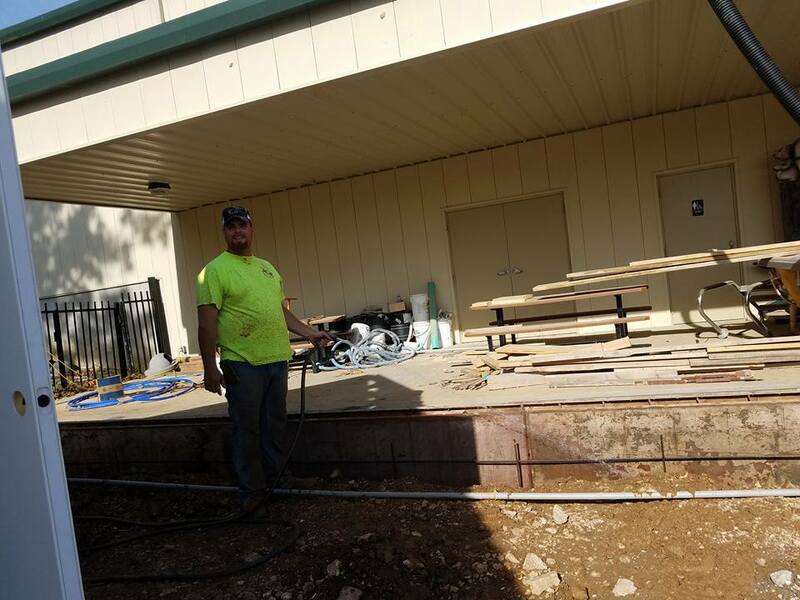 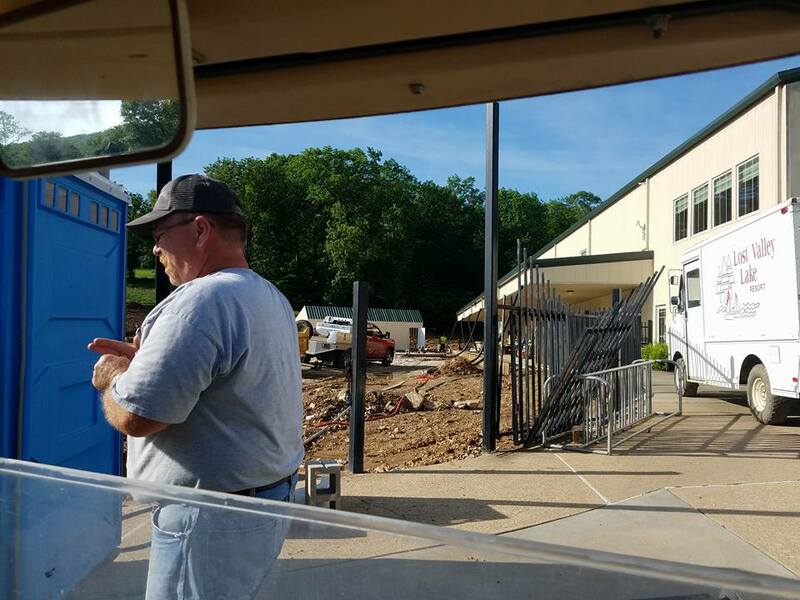 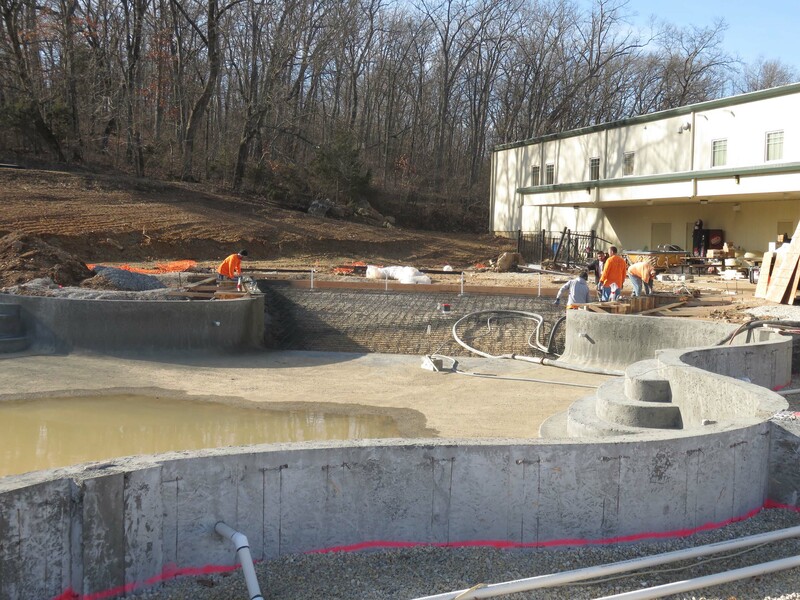 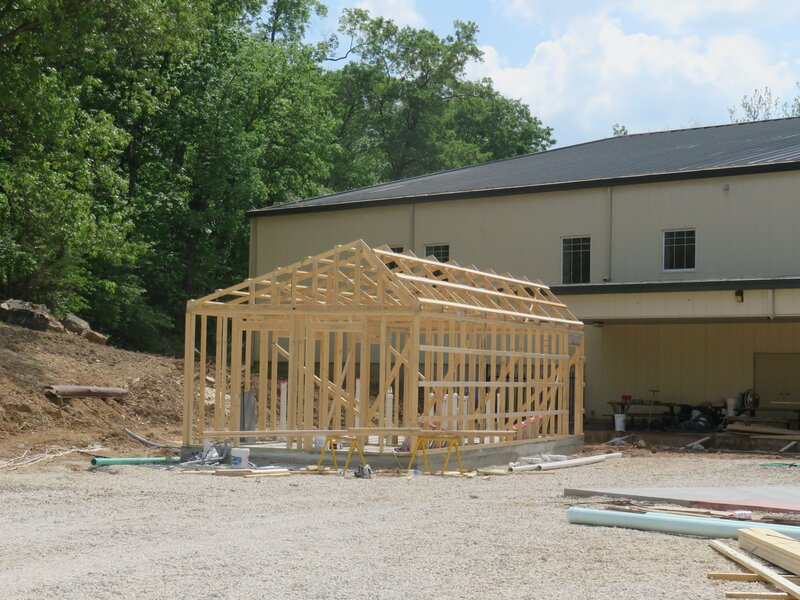 Filtration systems pumps being installed…. 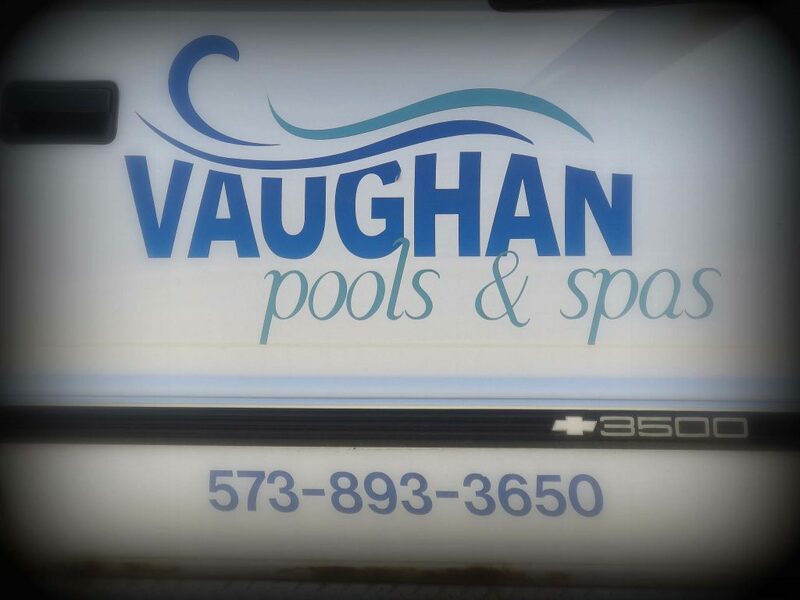 We are looking on the positive side of the forecast for this week & keeping our fingers crossed that Mother Nature will keep it dry! 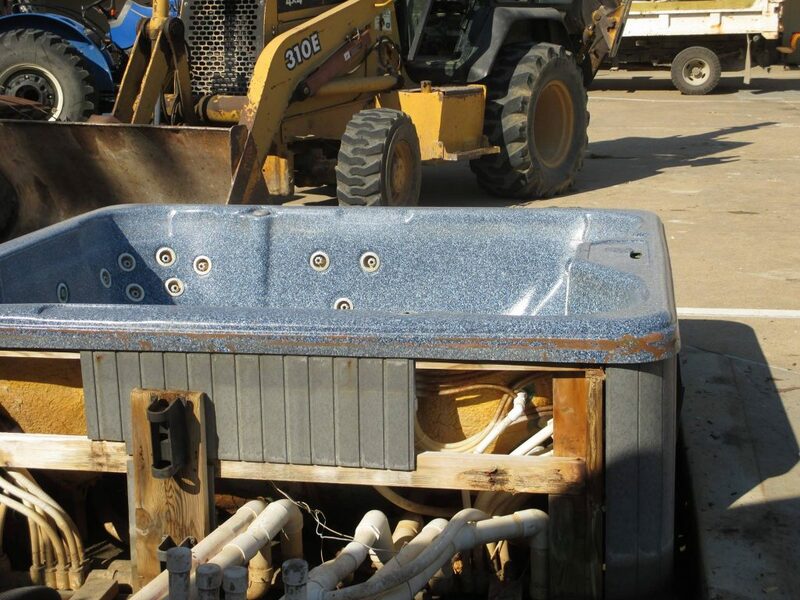 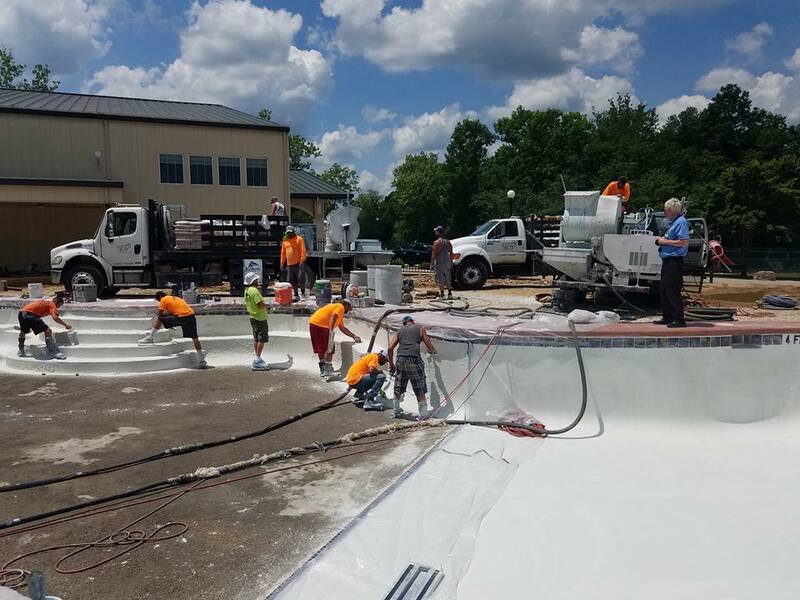 As long as that is the case we expect the pool to be usable, with more seating & more tables for your enjoyment Memorial Weekend. 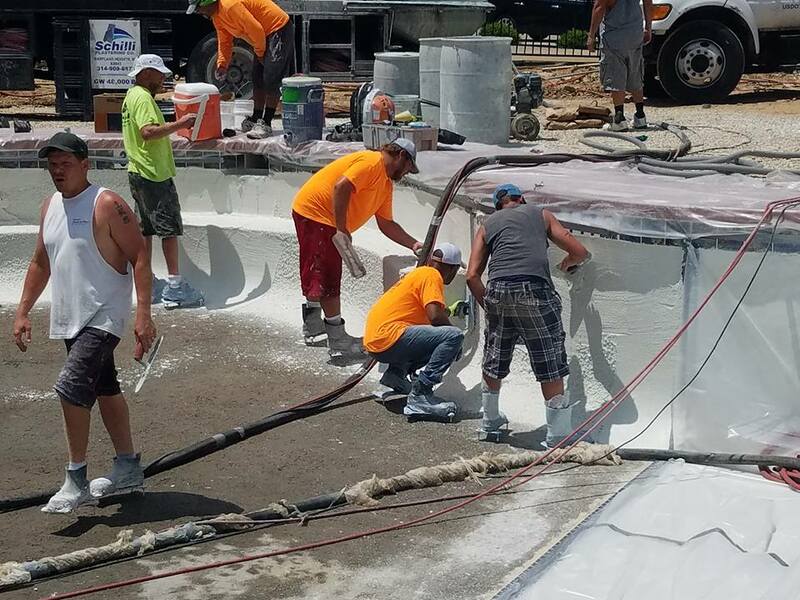 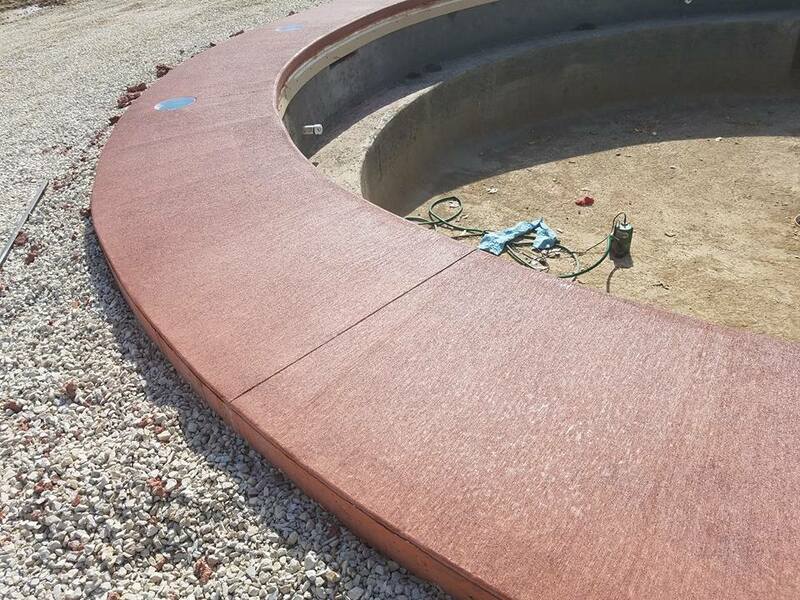 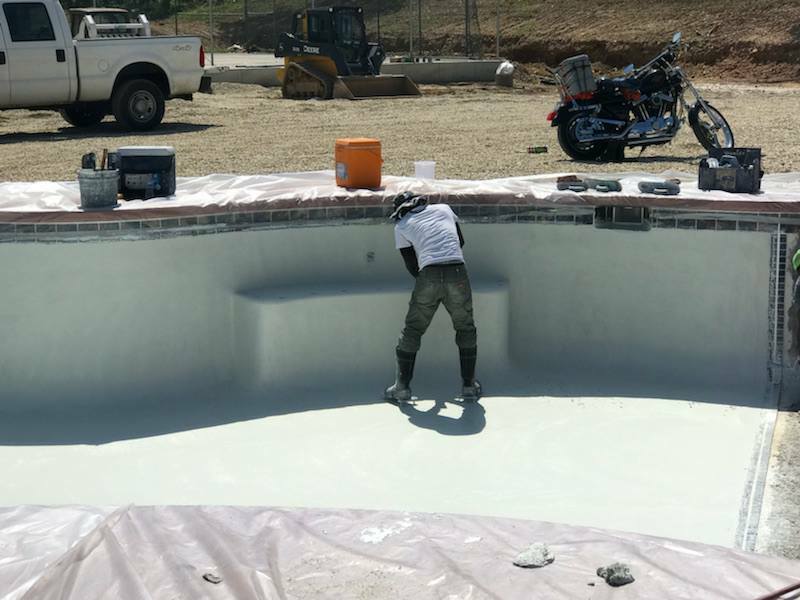 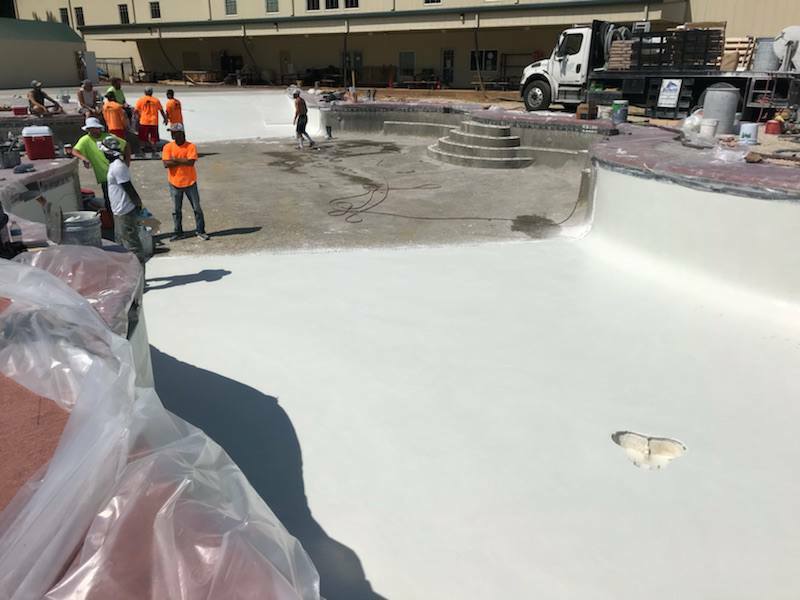 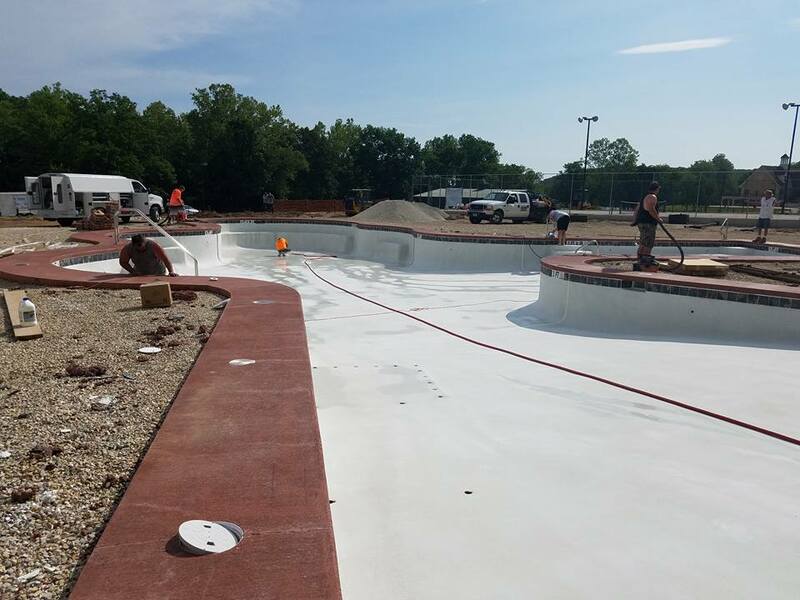 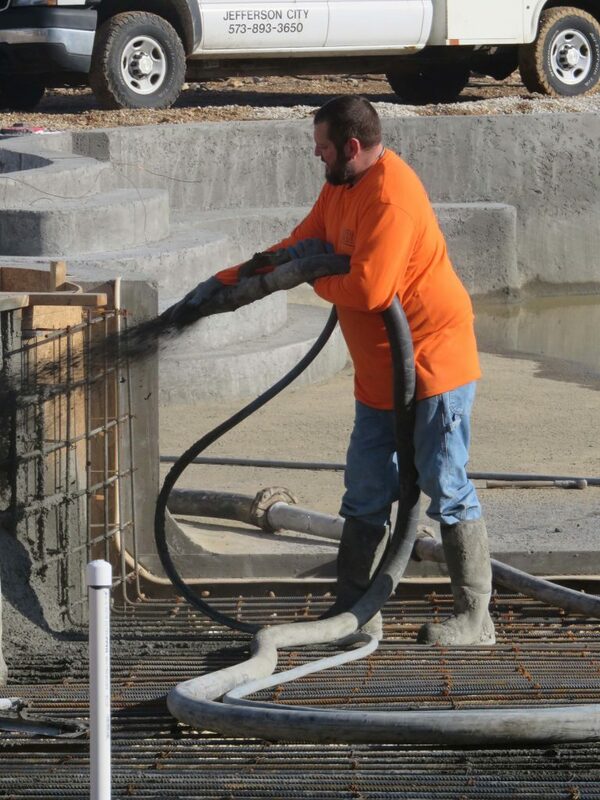 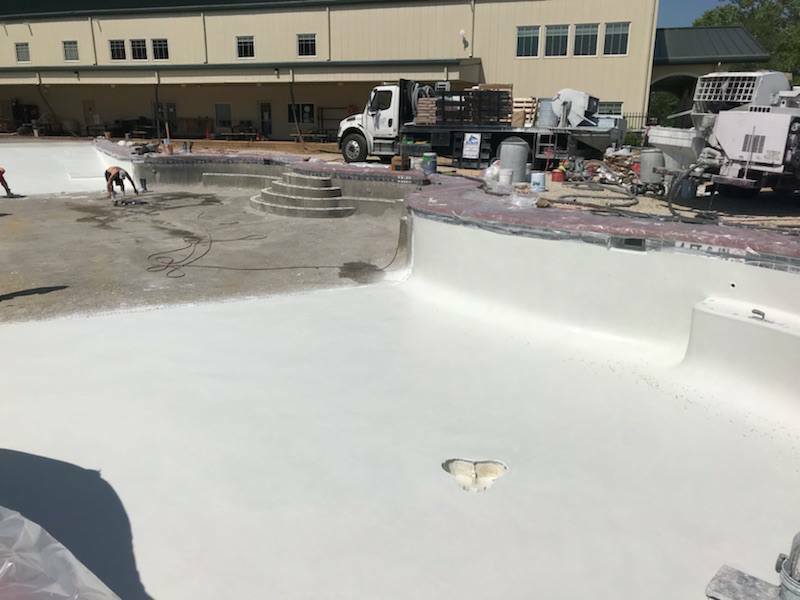 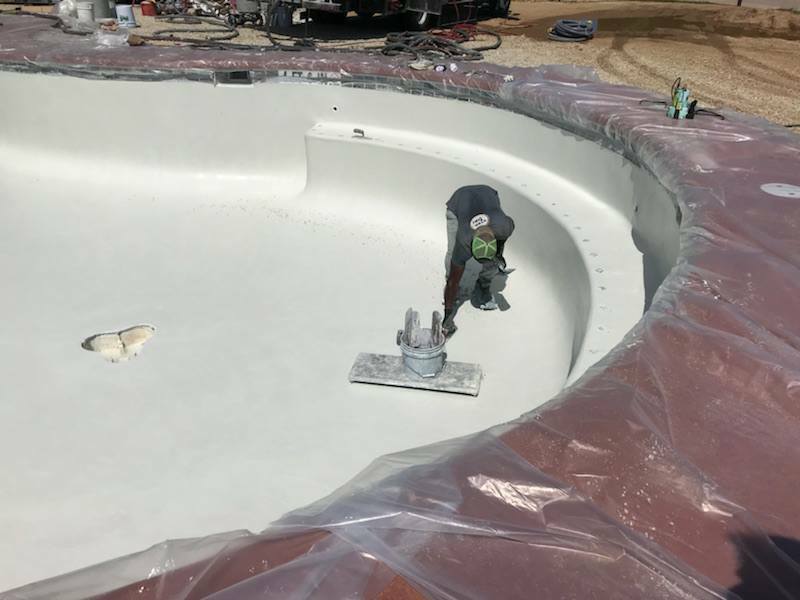 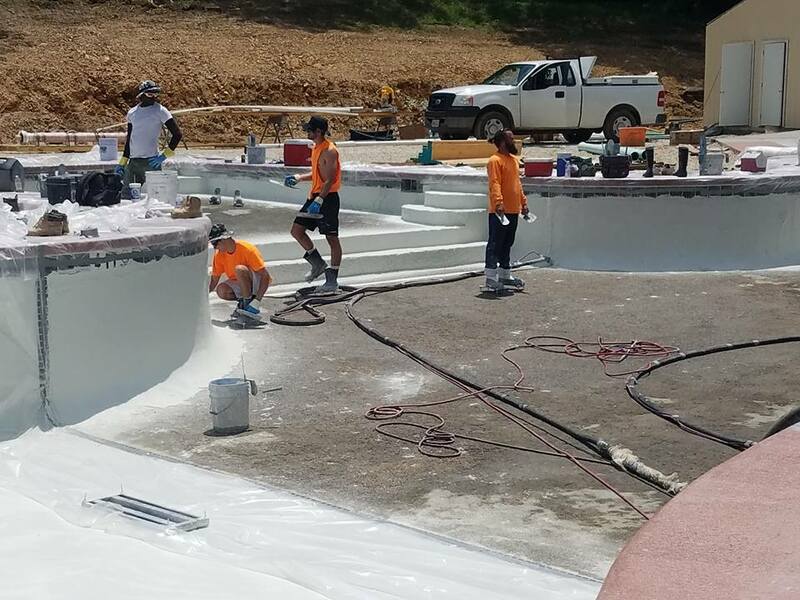 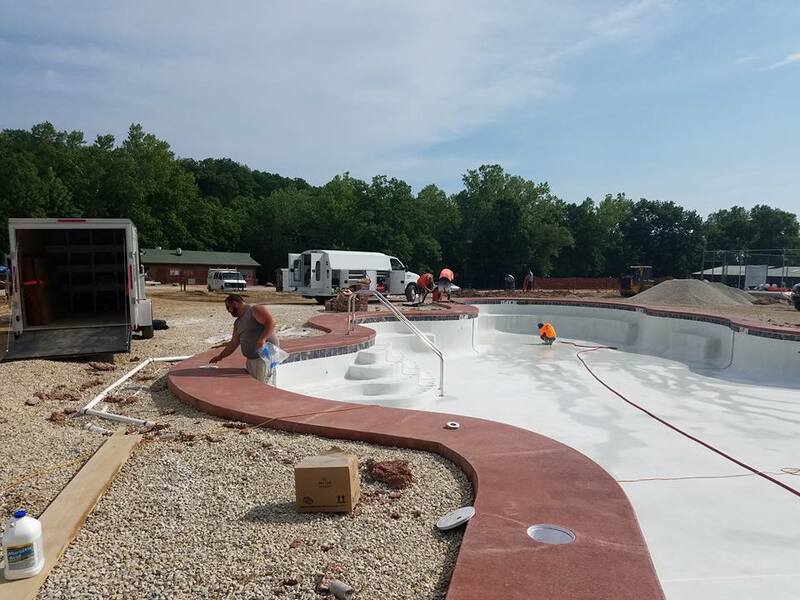 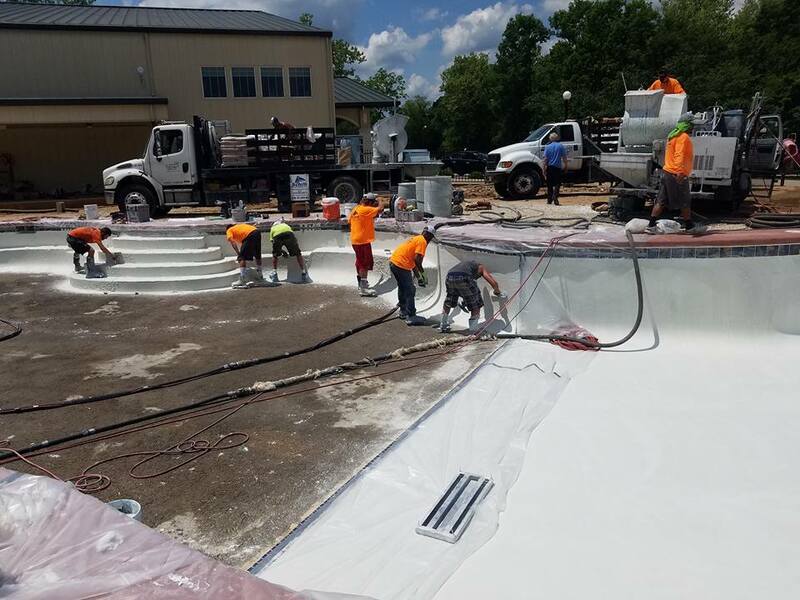 Randy is staining the coping around the pool today. 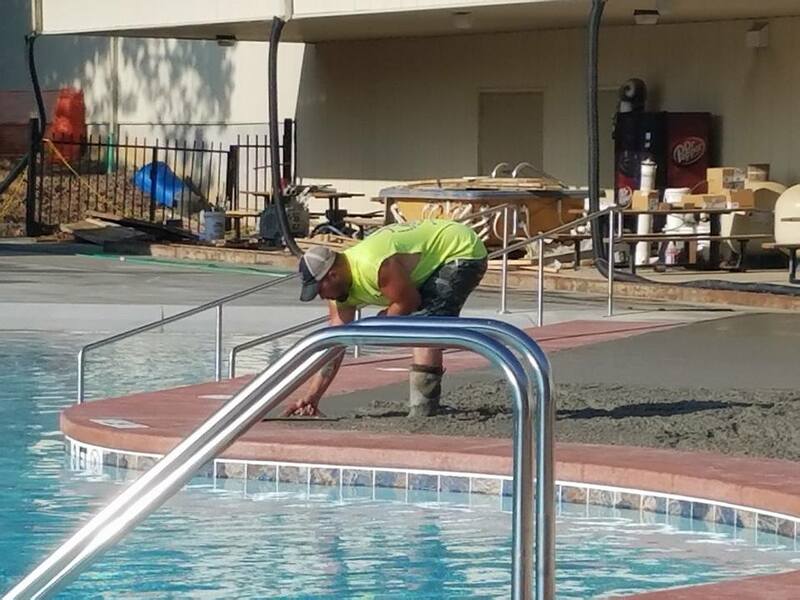 Tried to get the pool guys to pose for a picture, only one played along. 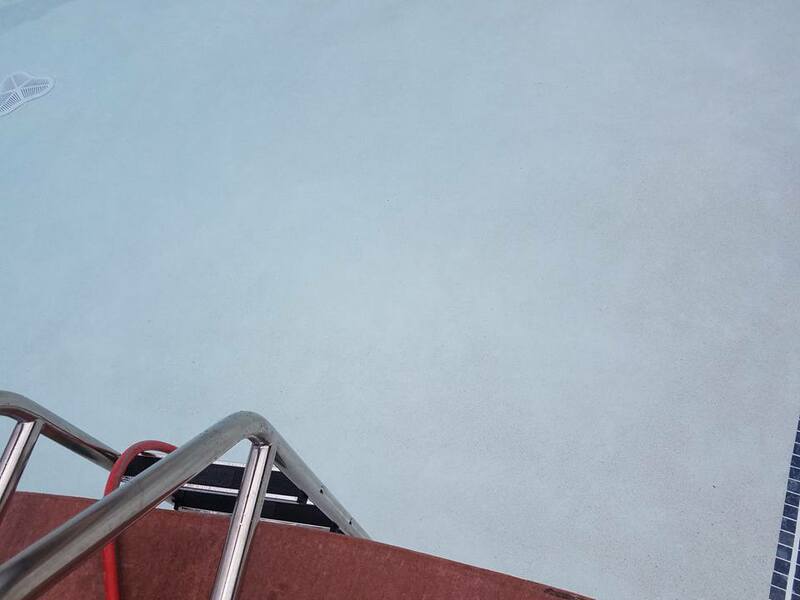 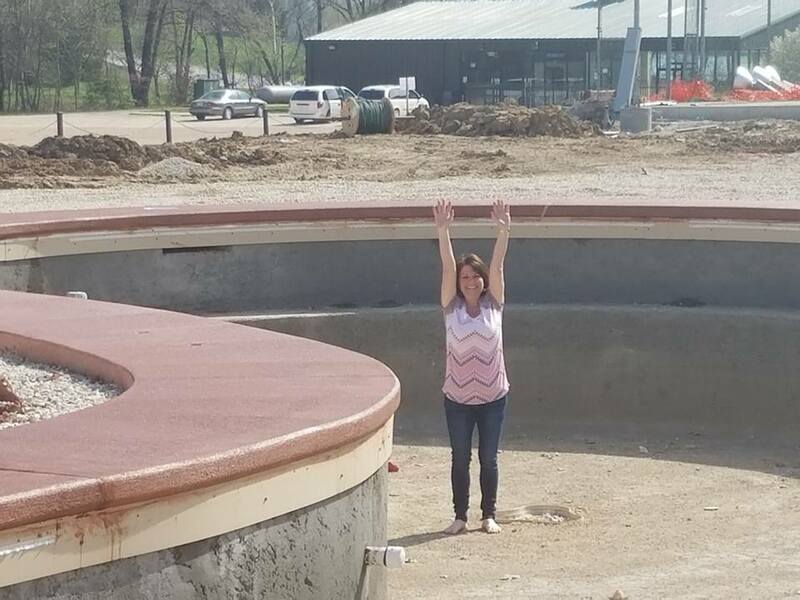 I did talk the Marketing Manager into getting in the pool barefoot for perspective. 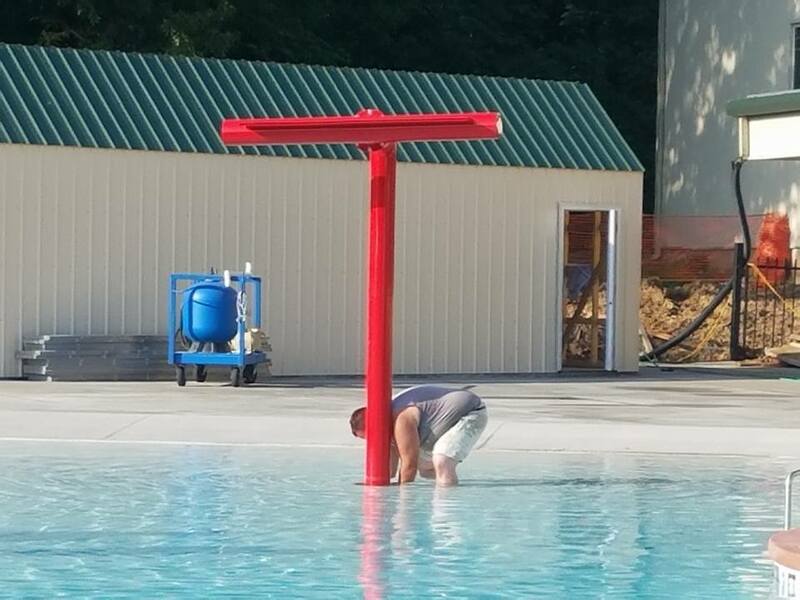 When I asked her how tall she was she said 6', but I believe it's really 4' 11". 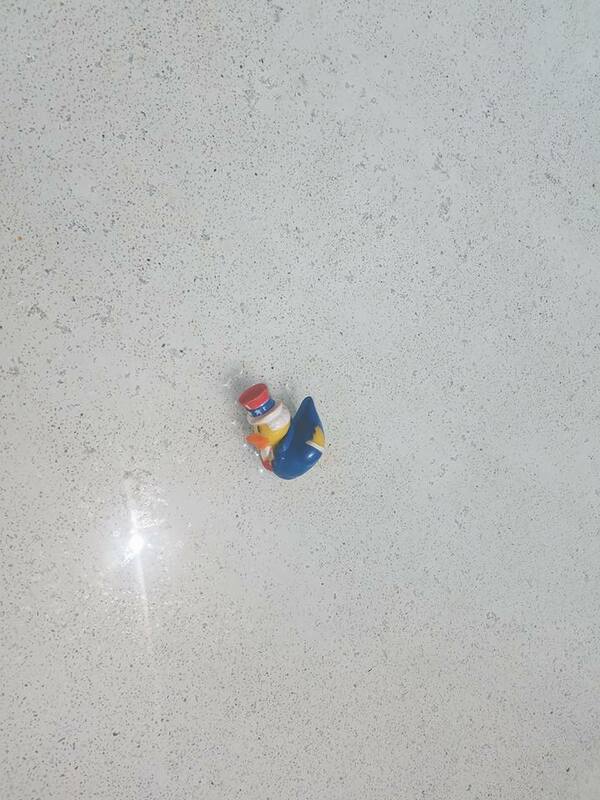 Thanks, Sherri! 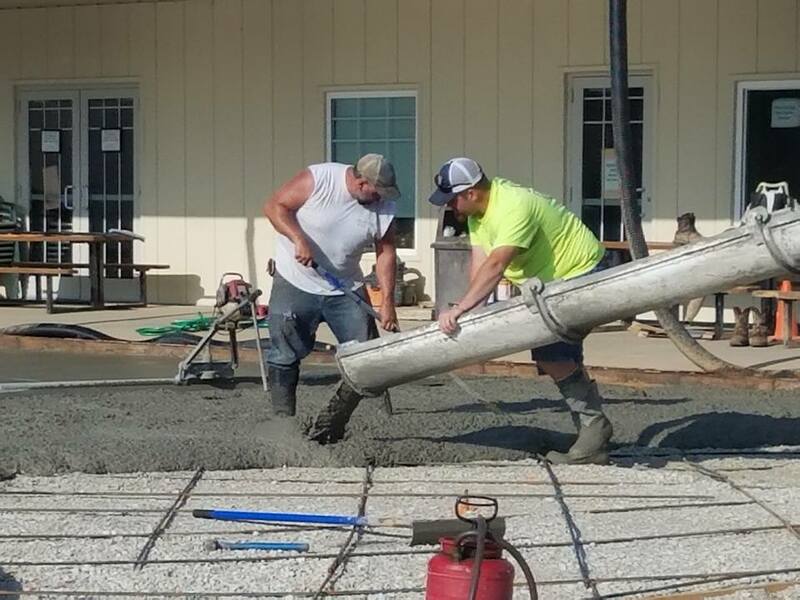 Getting it ready to pour the deck! 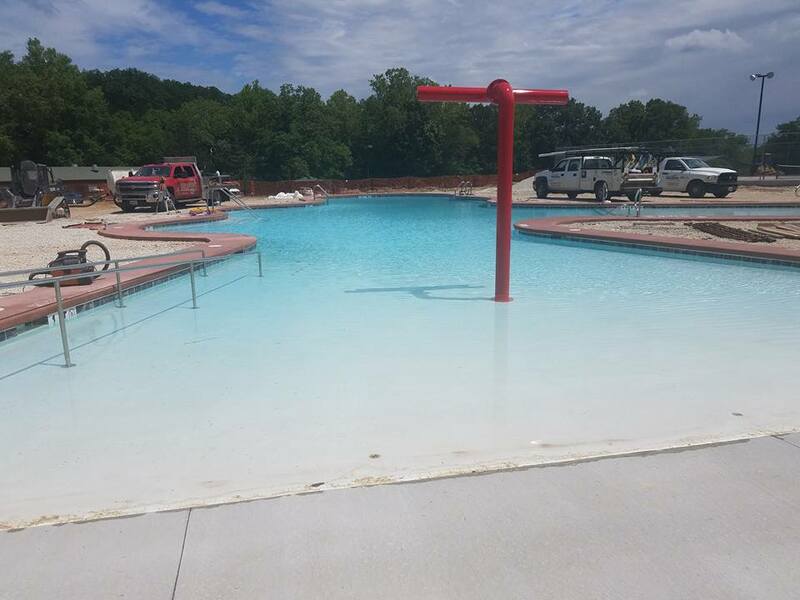 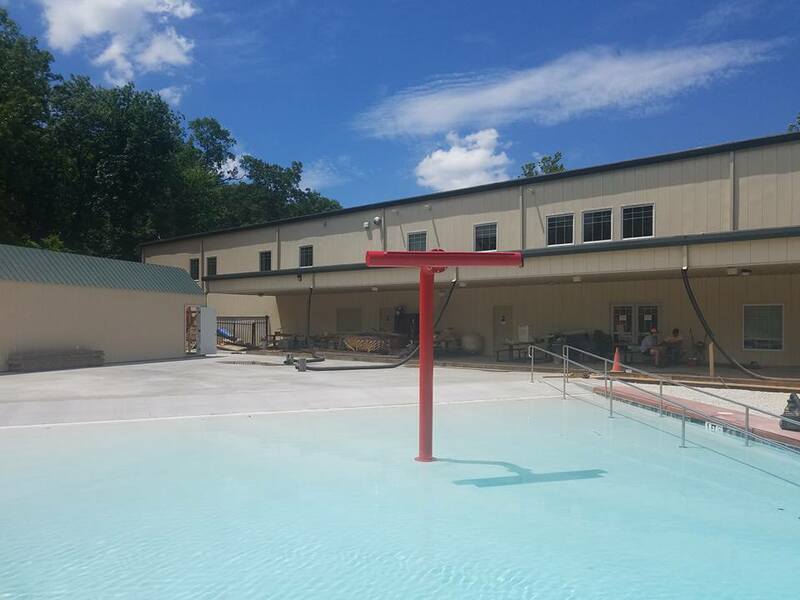 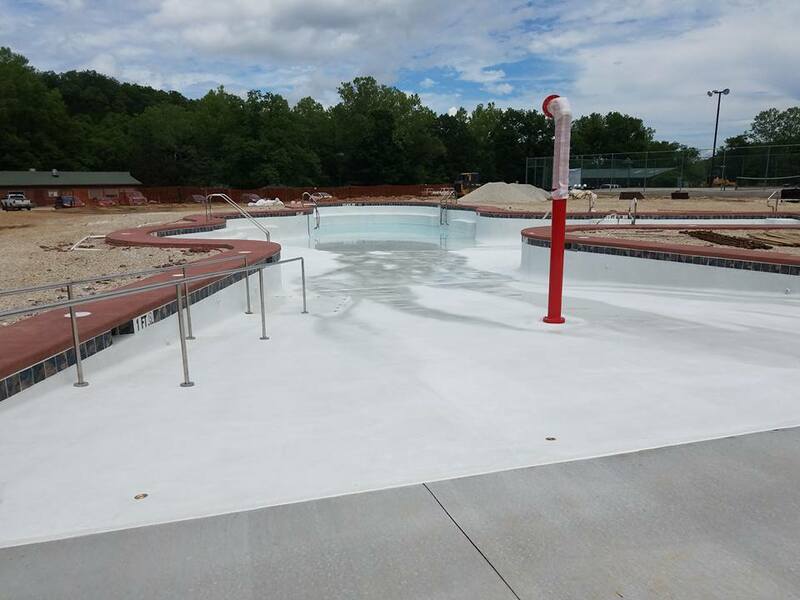 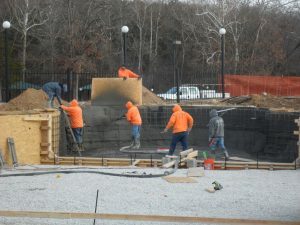 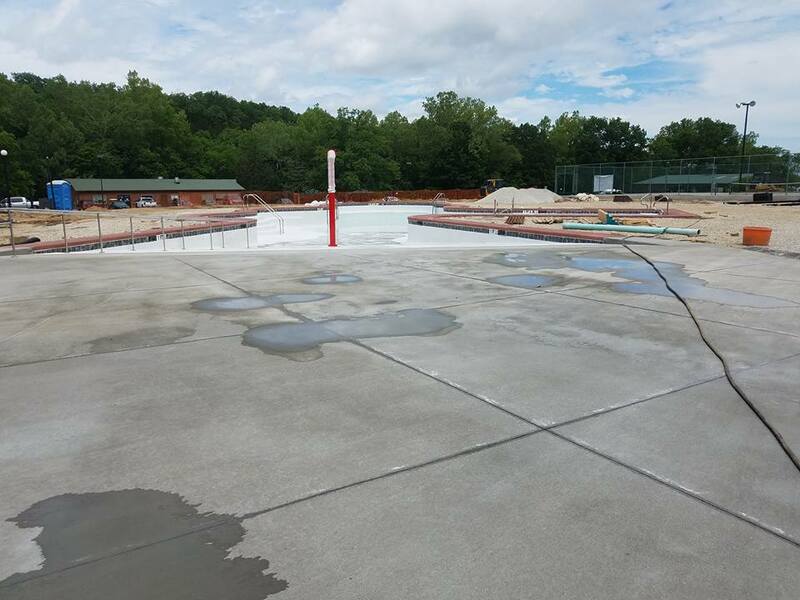 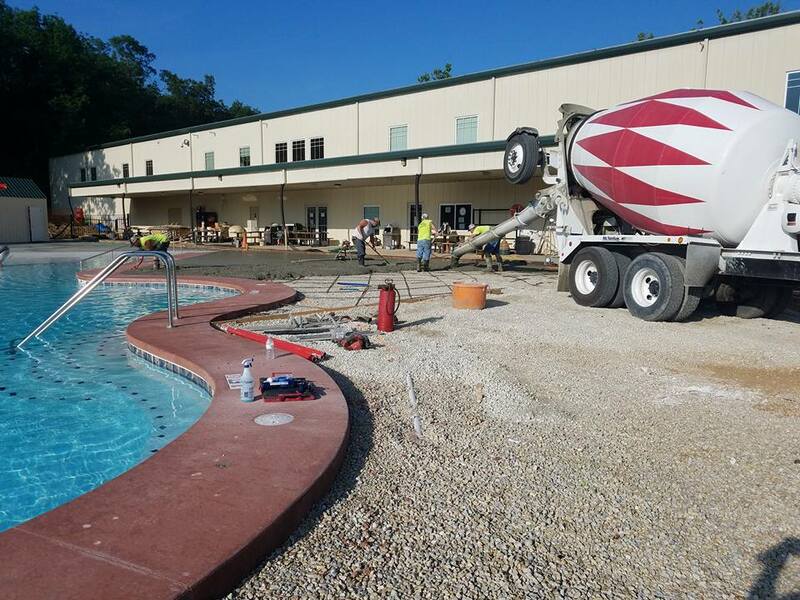 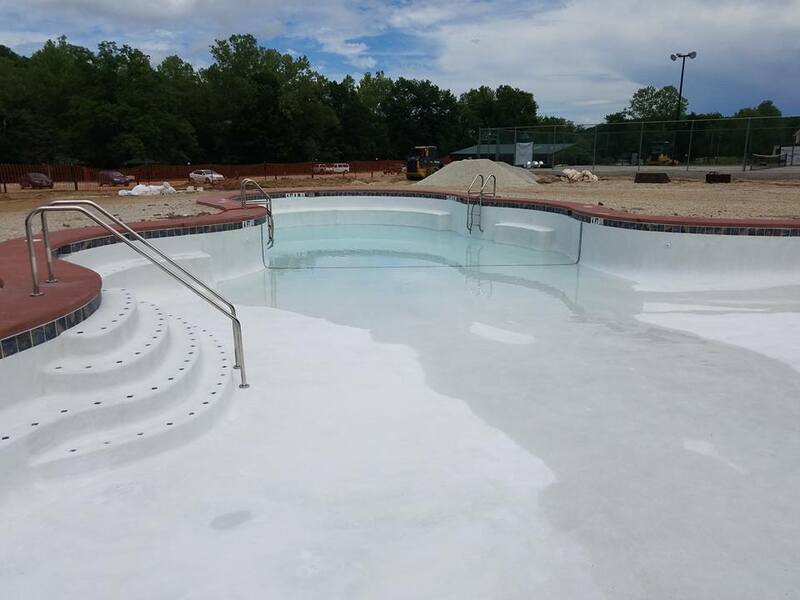 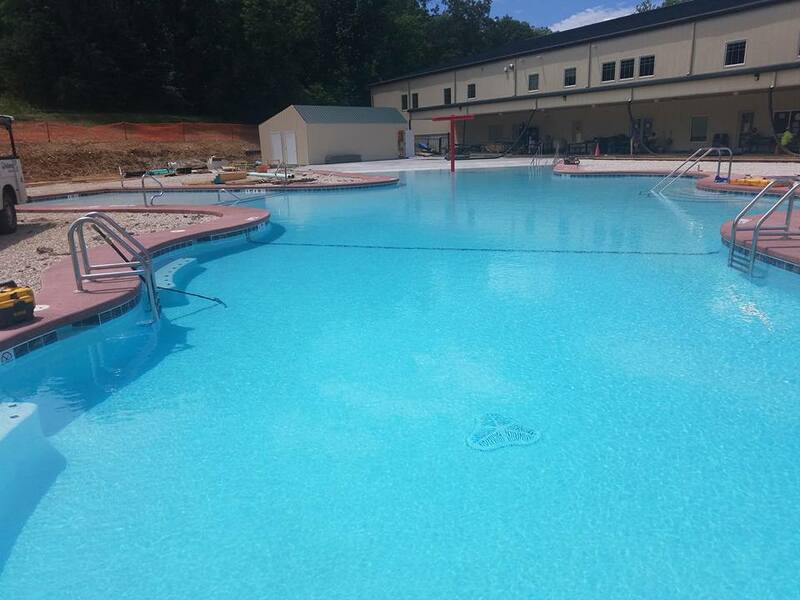 A nice break in the weather today is allowing work to be done around the new pool. 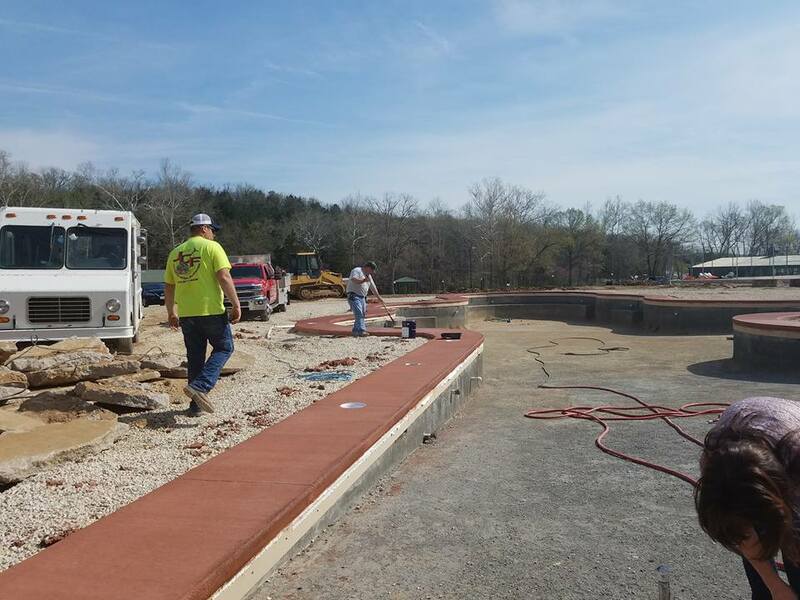 Our crews are working hard to level out the loads of gravel that have been brought in. 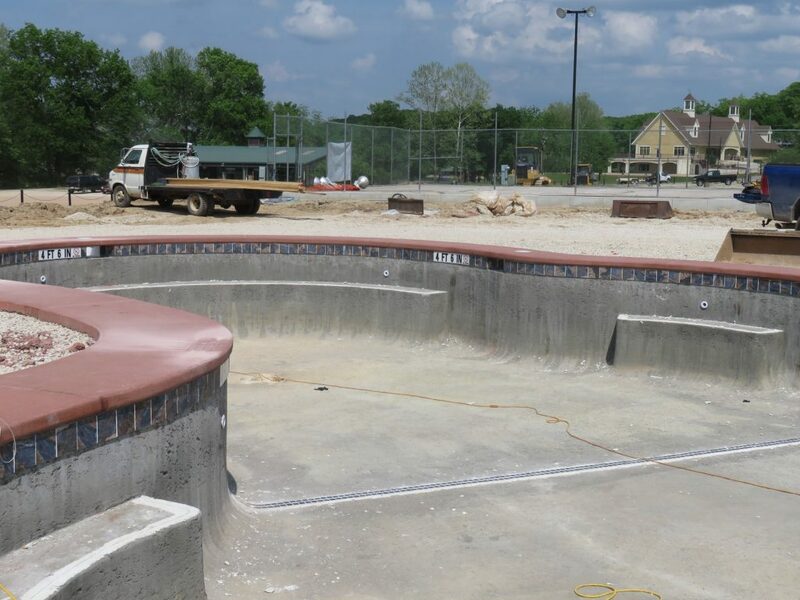 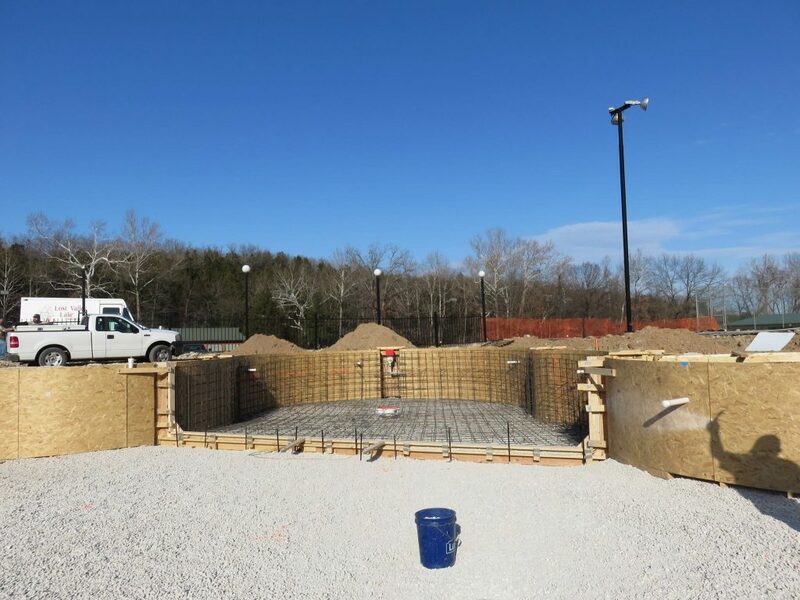 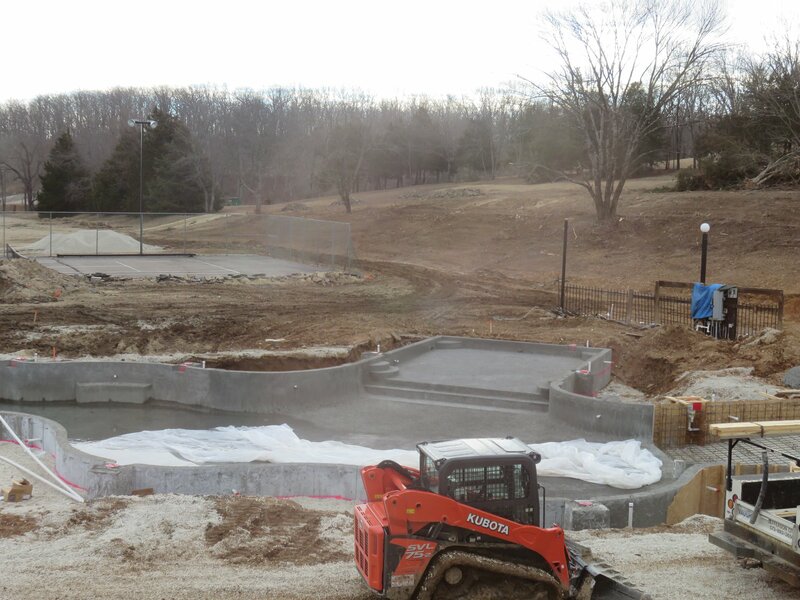 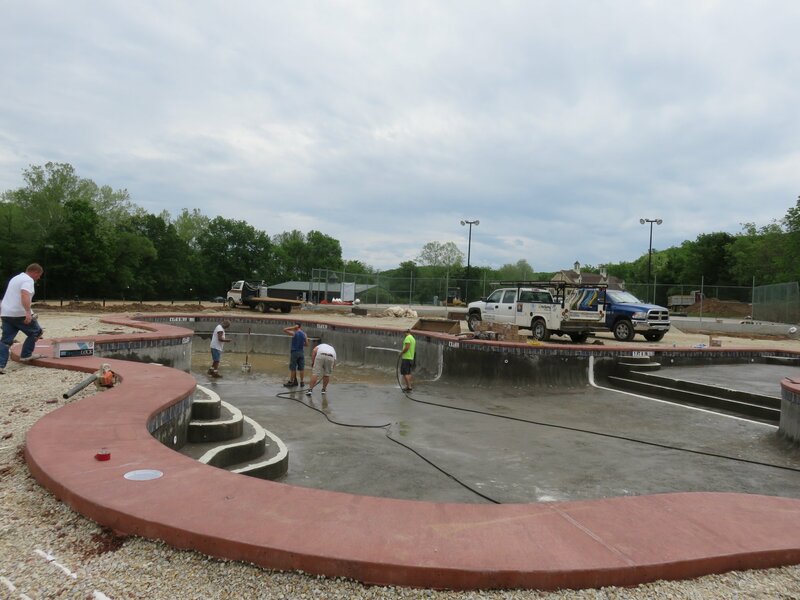 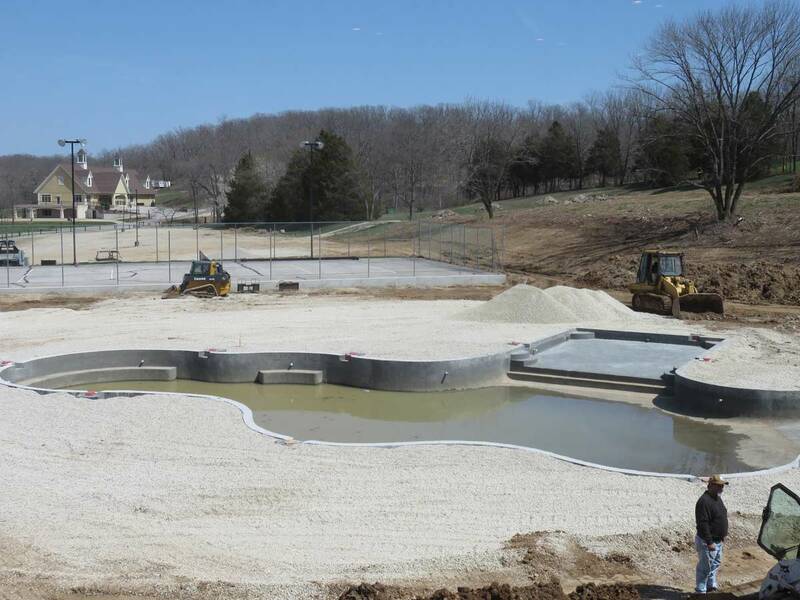 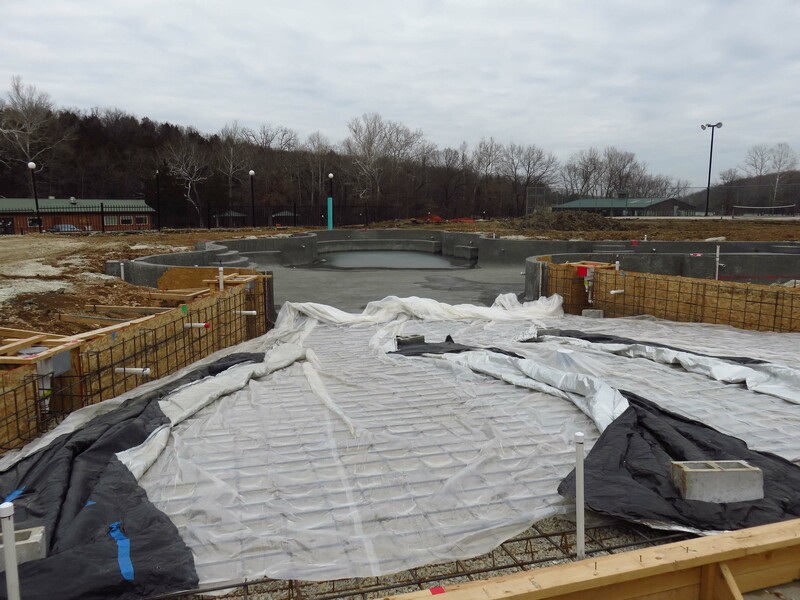 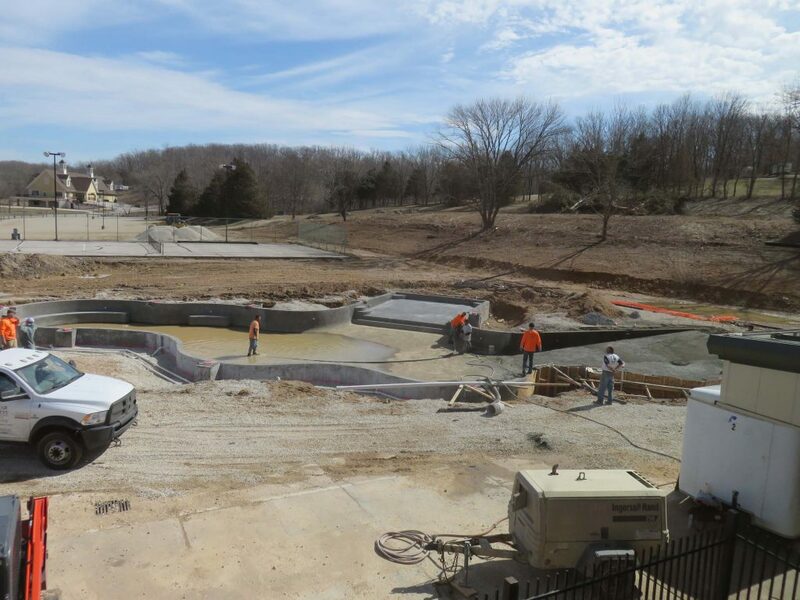 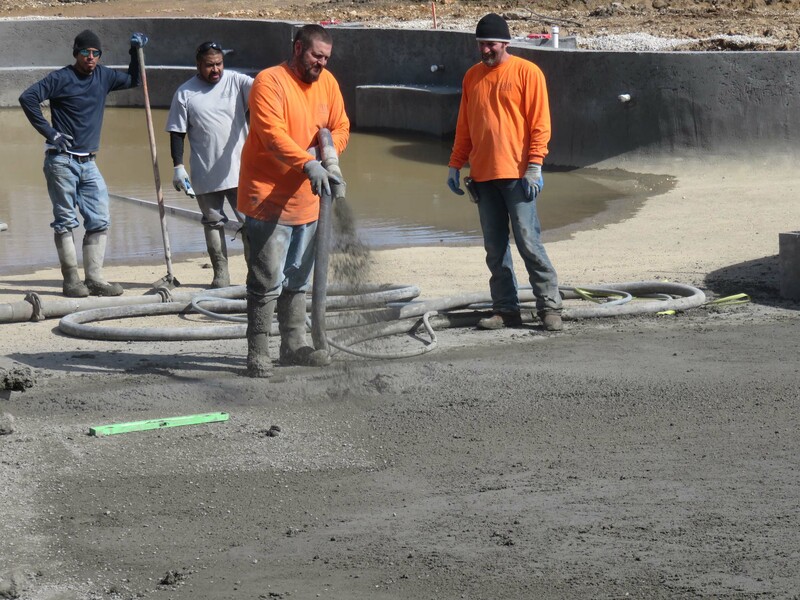 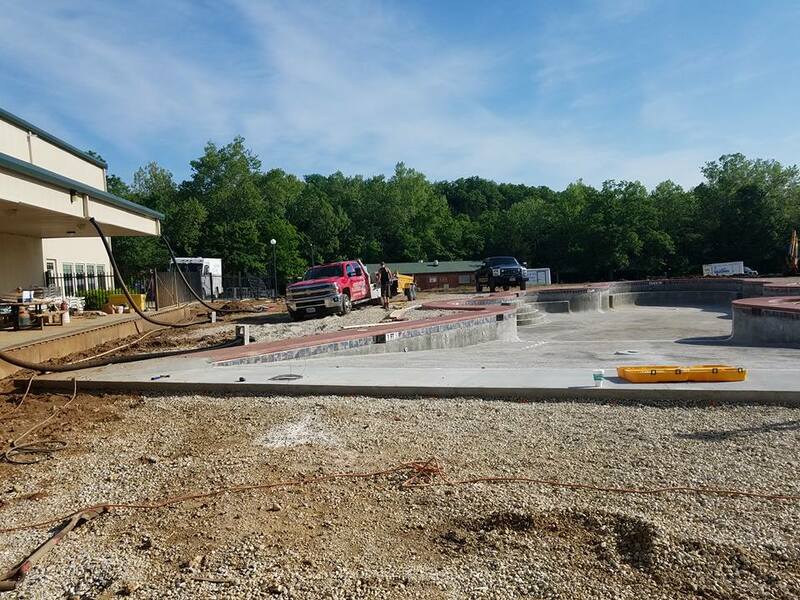 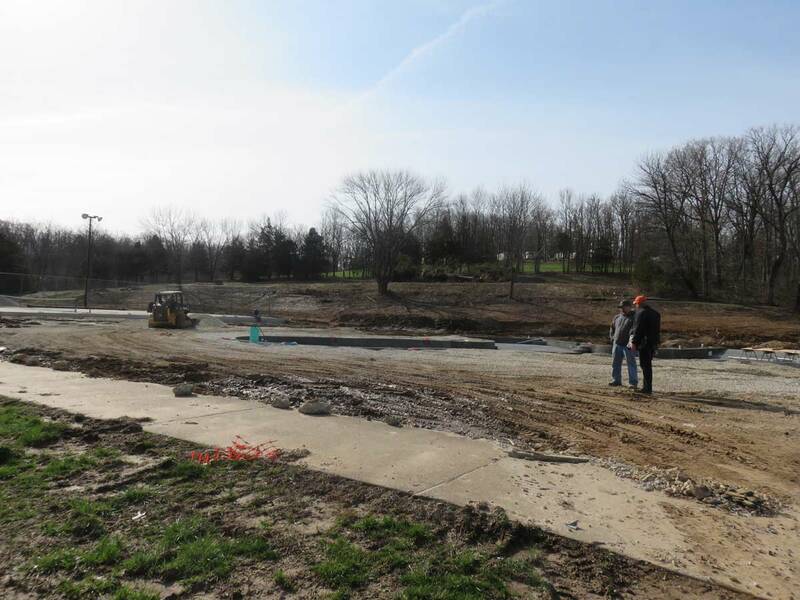 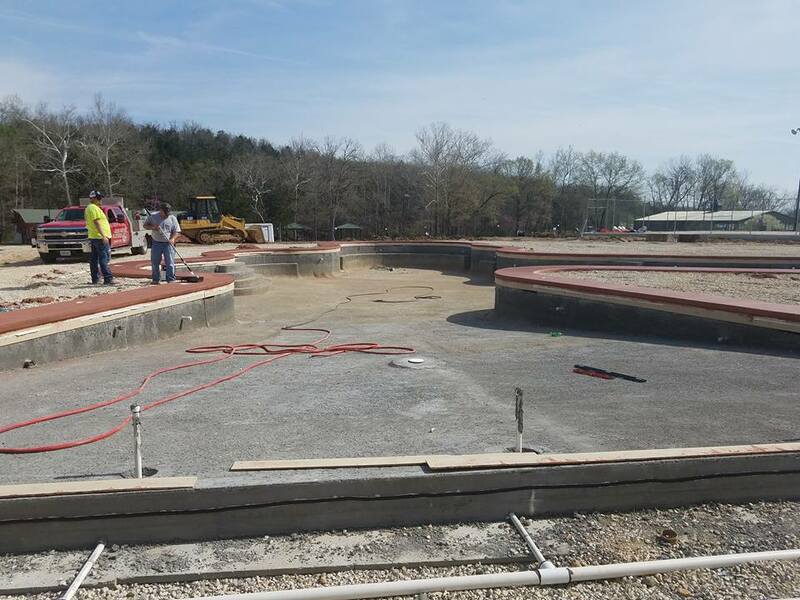 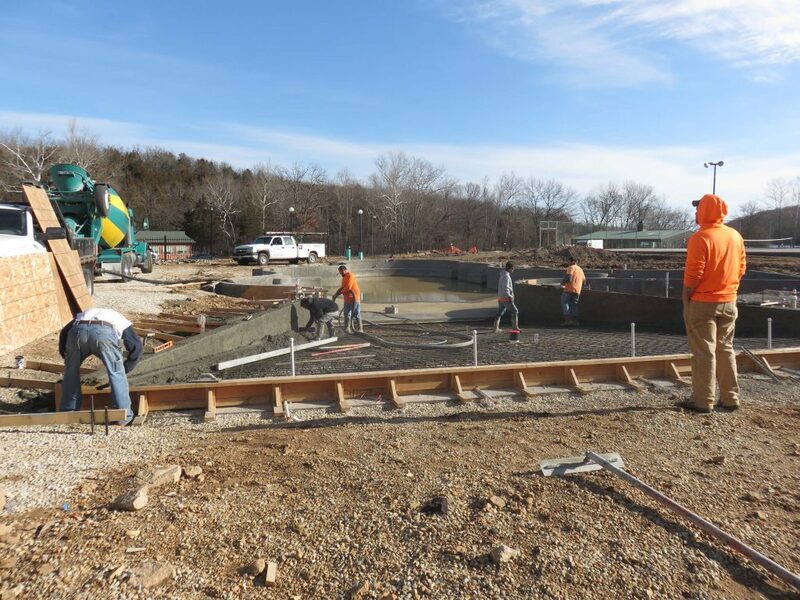 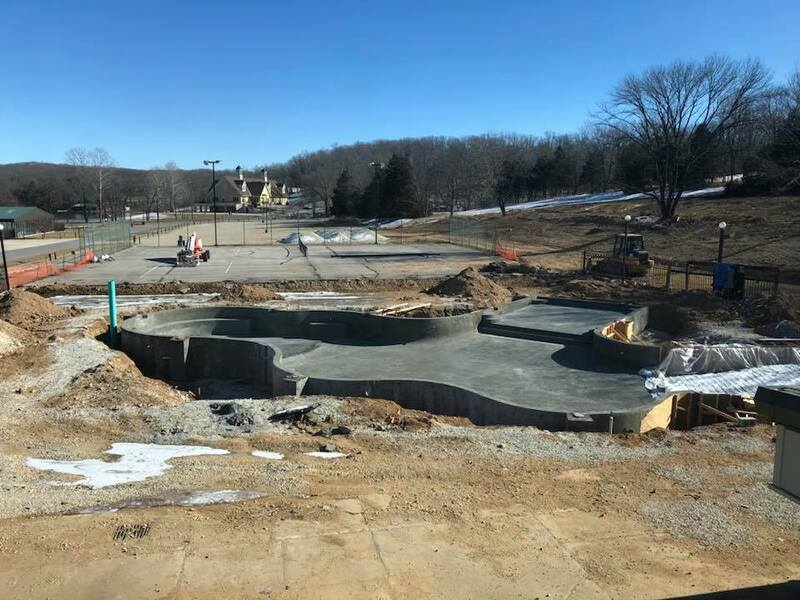 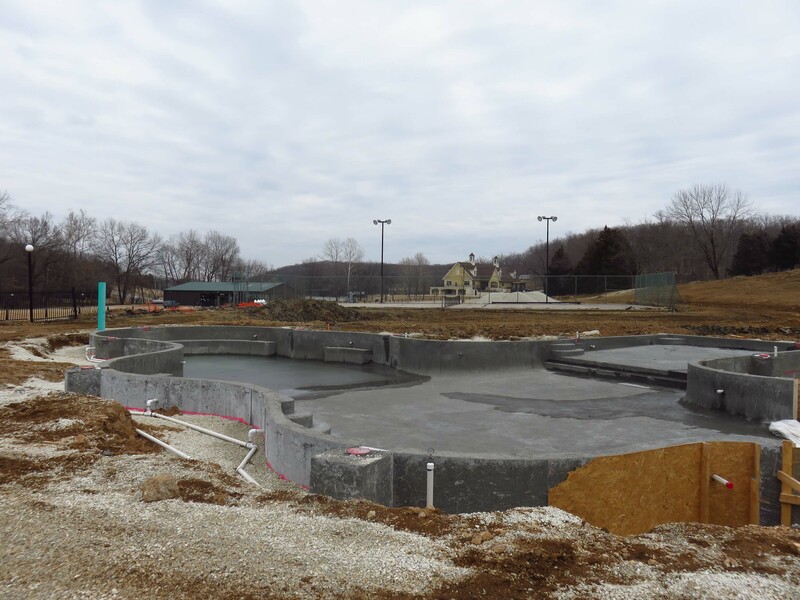 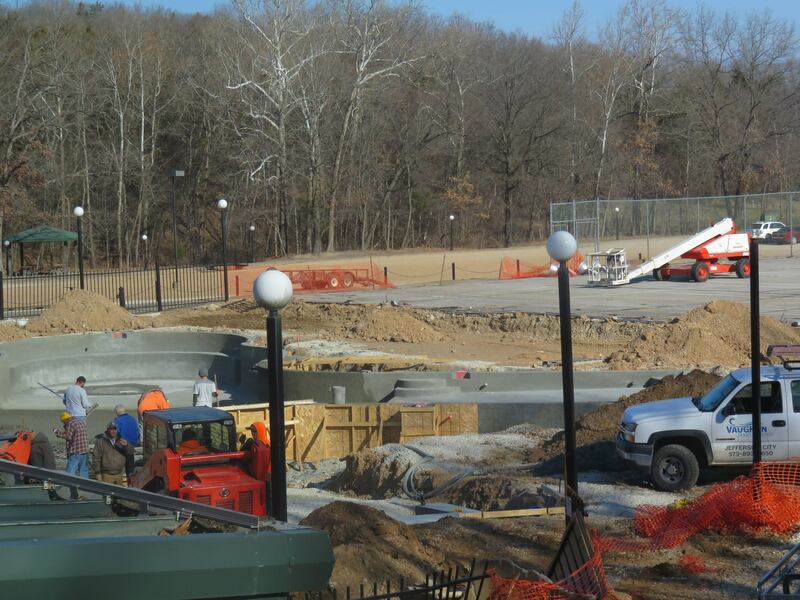 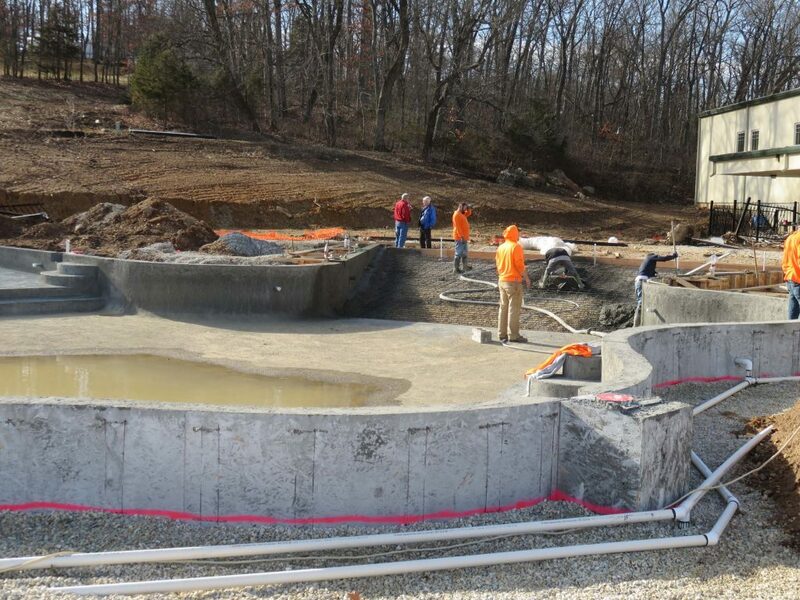 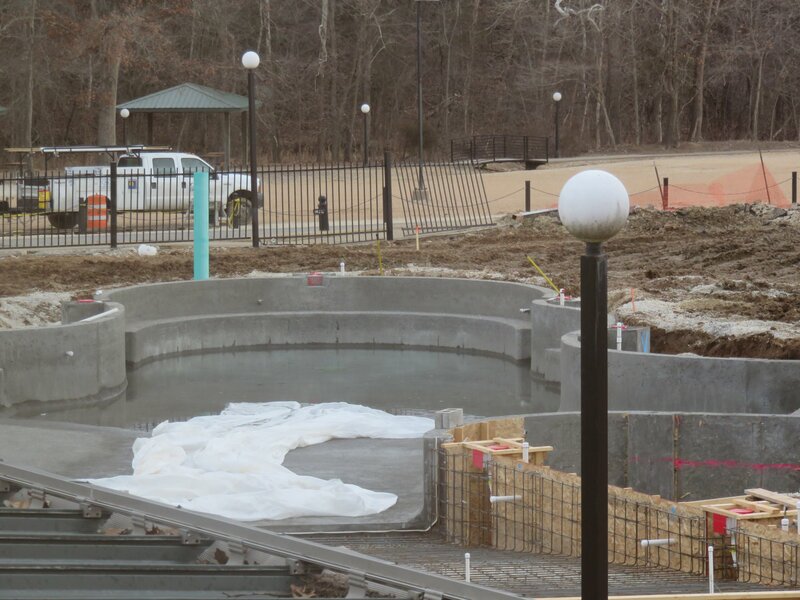 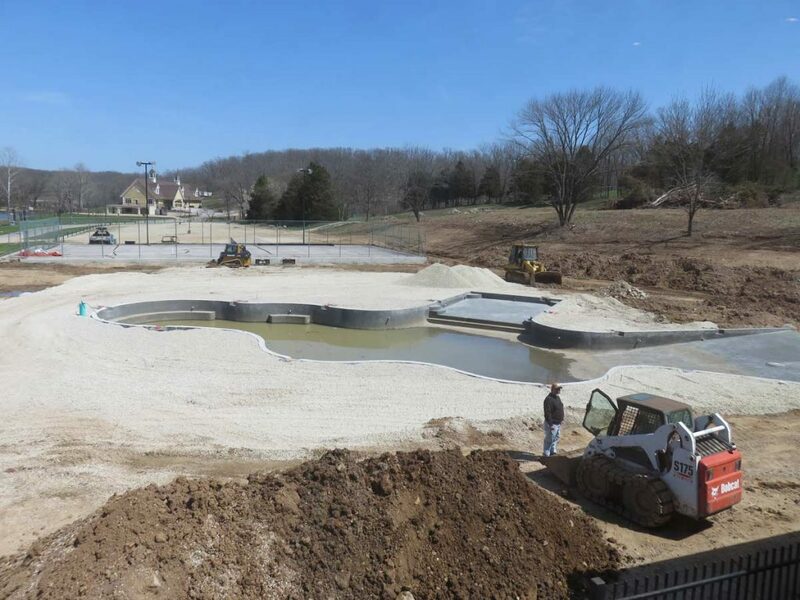 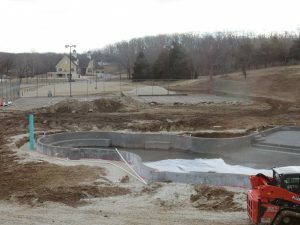 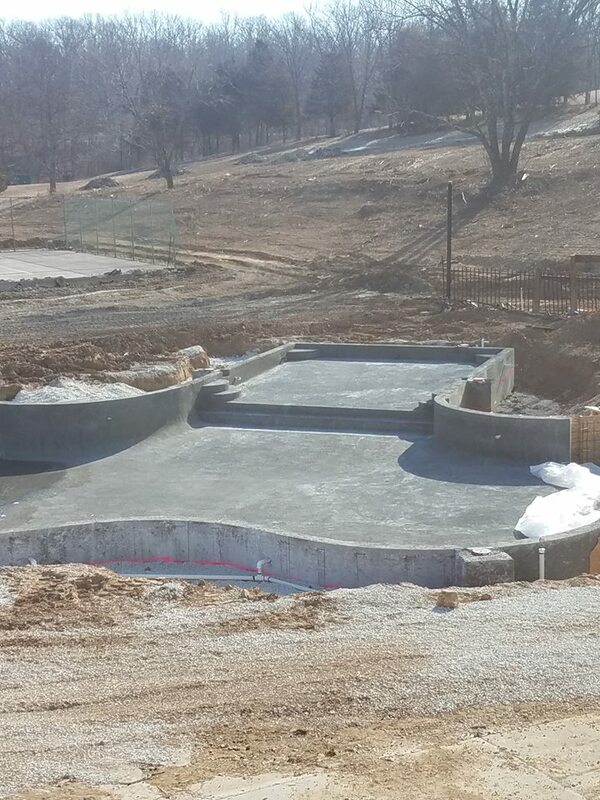 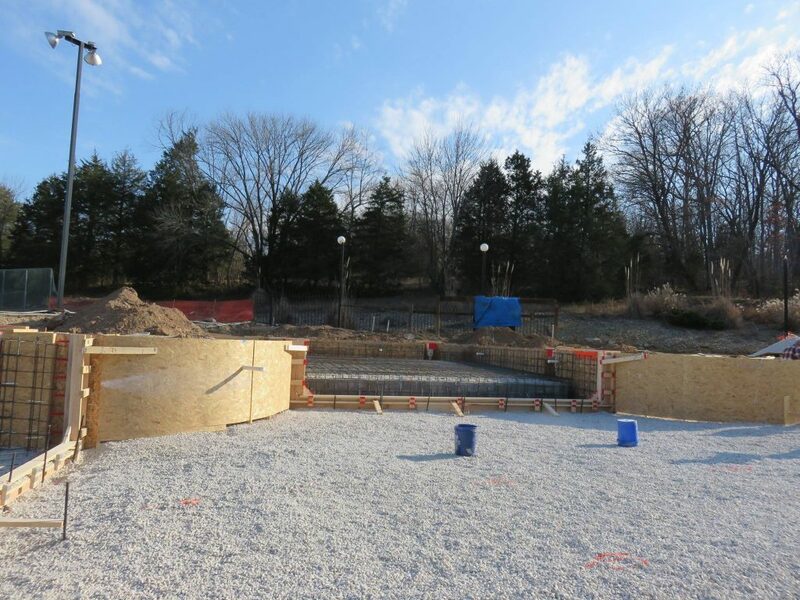 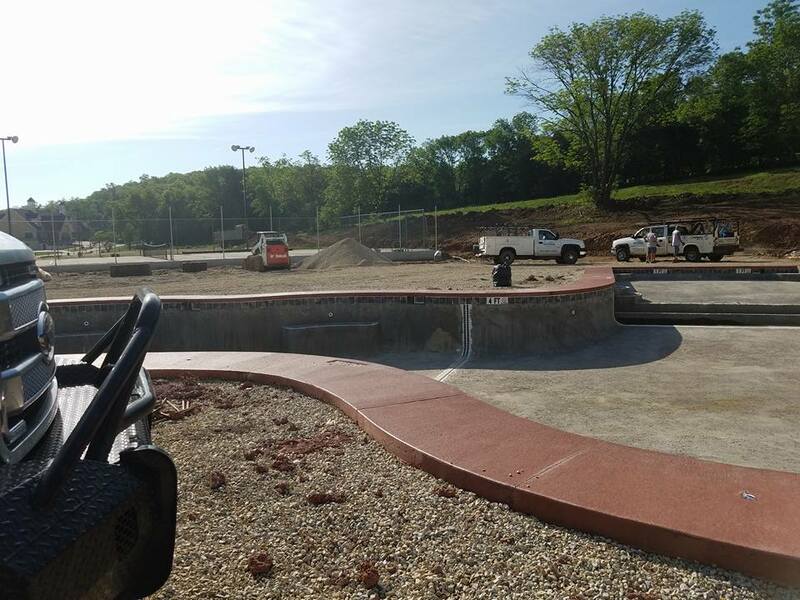 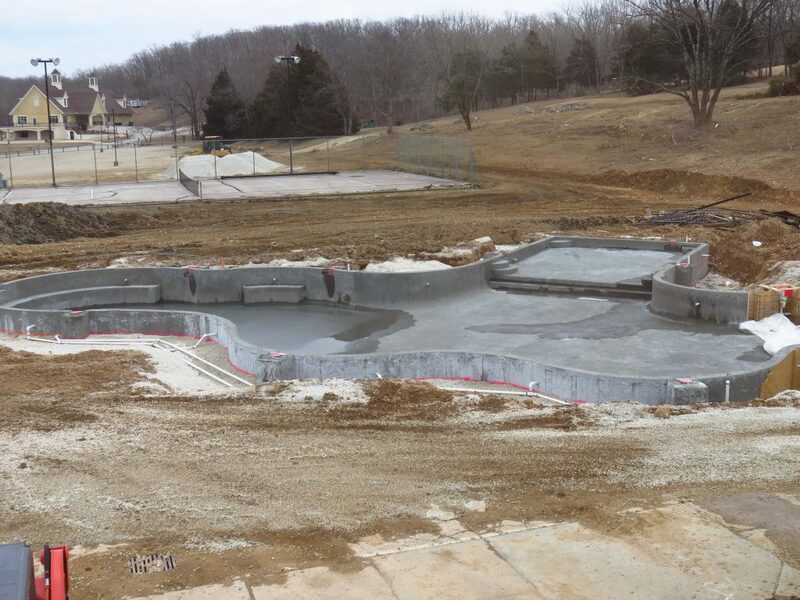 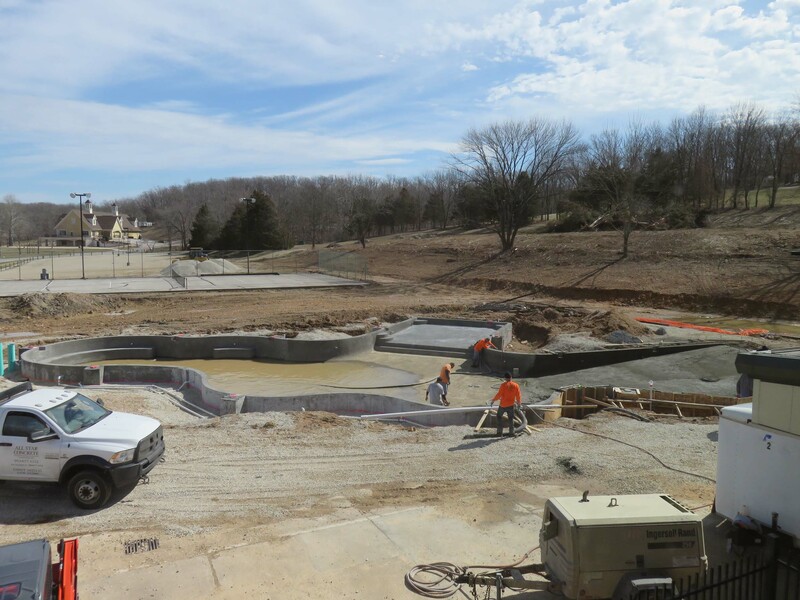 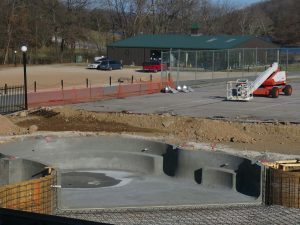 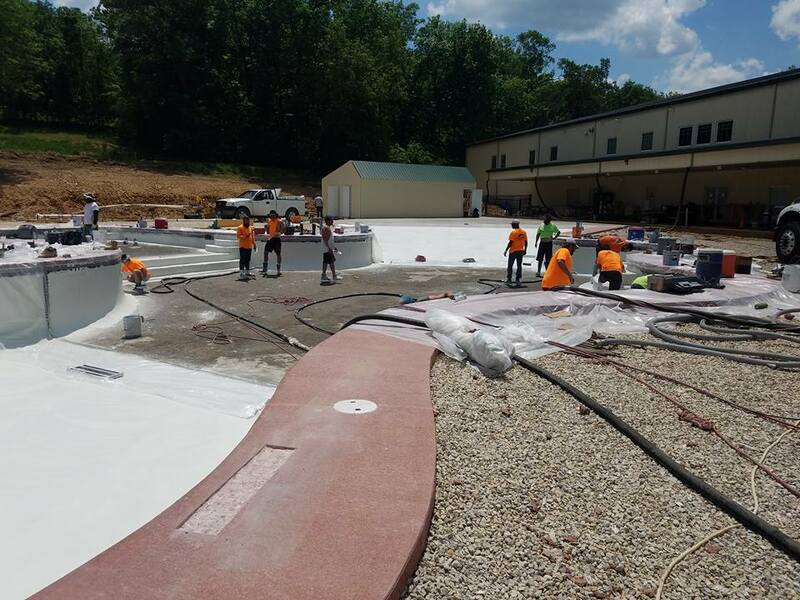 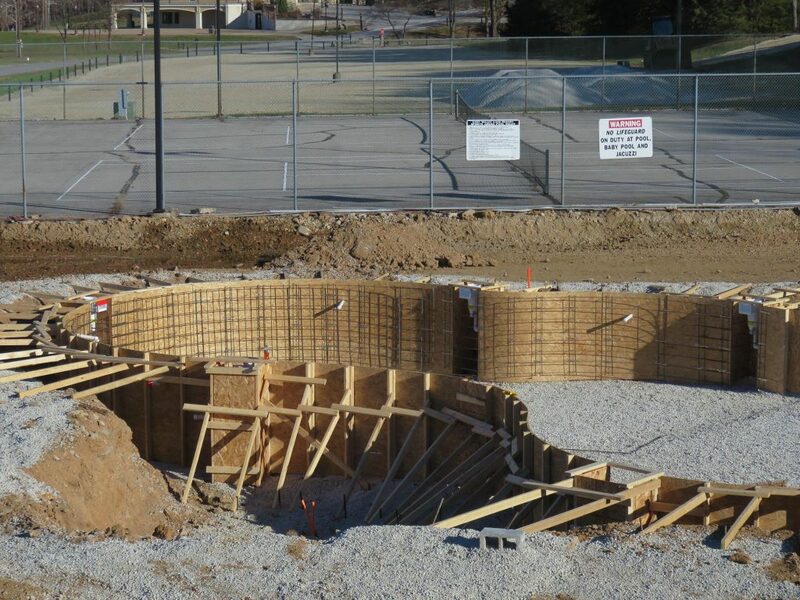 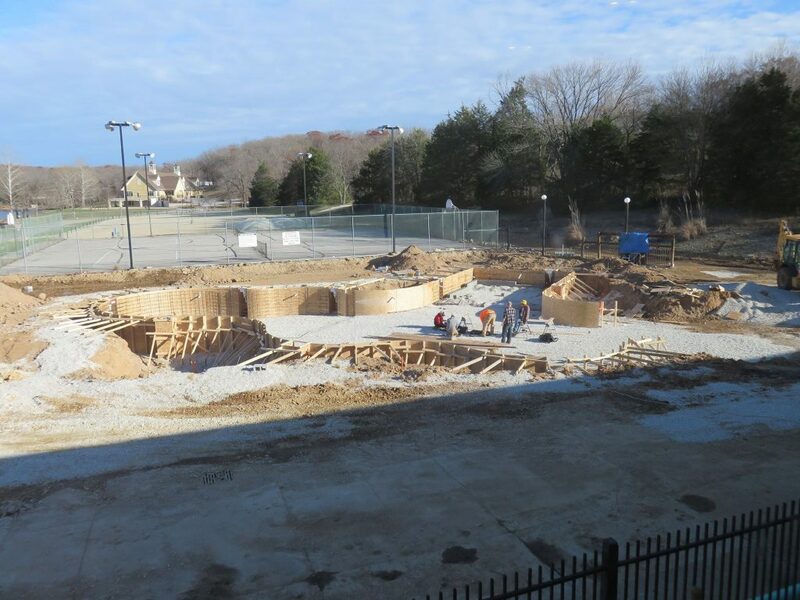 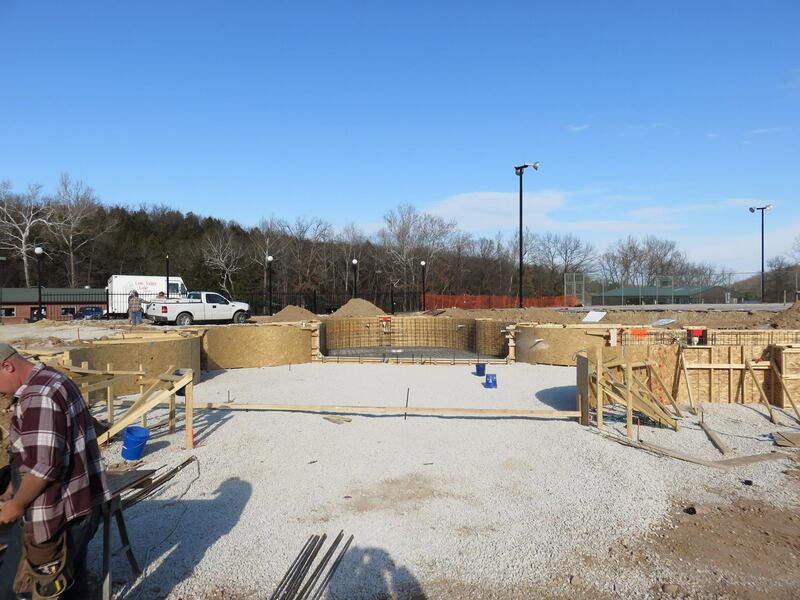 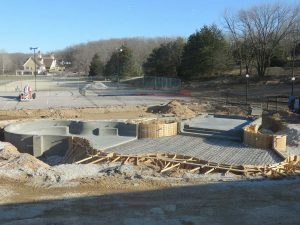 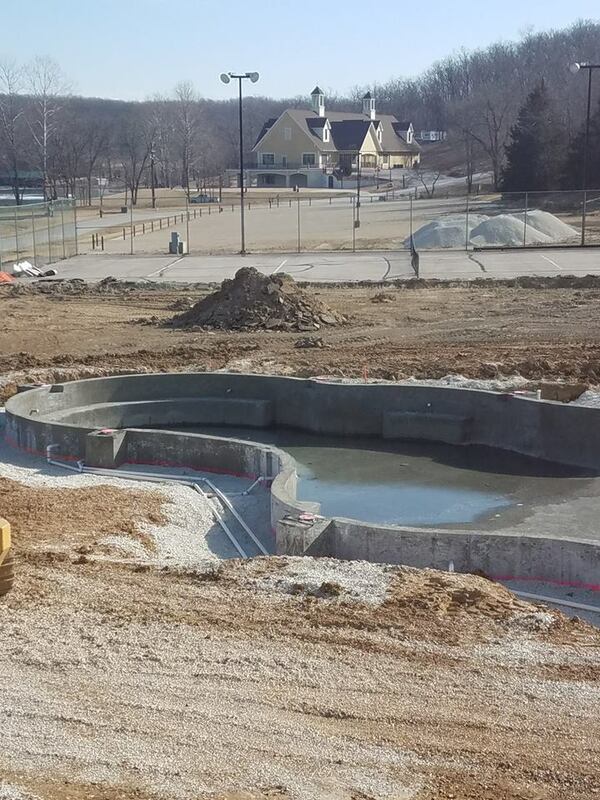 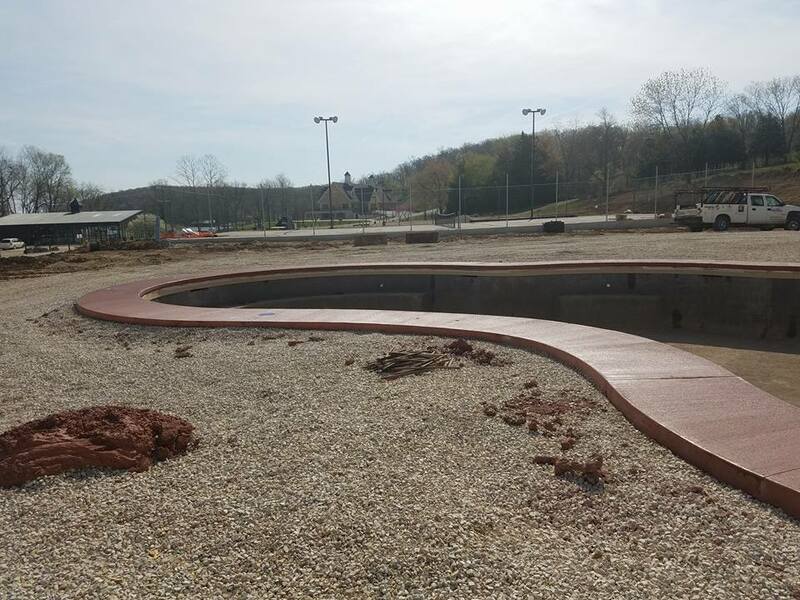 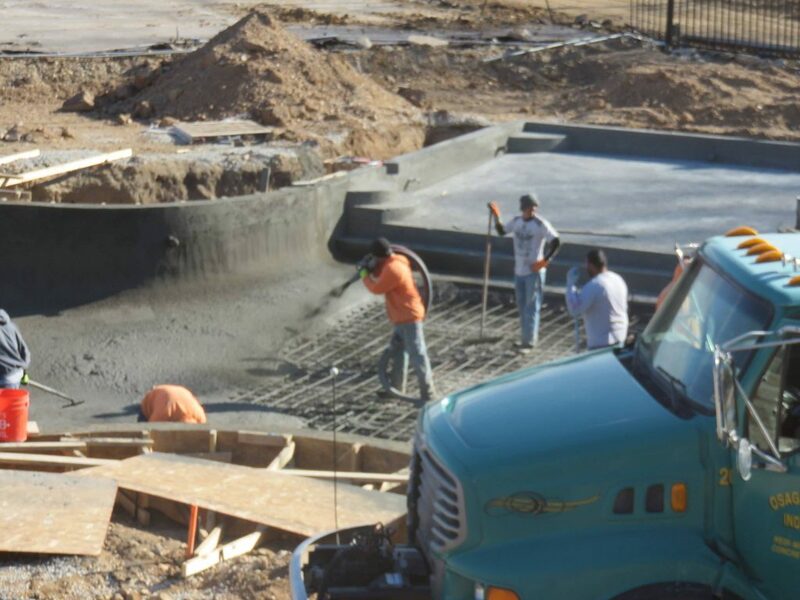 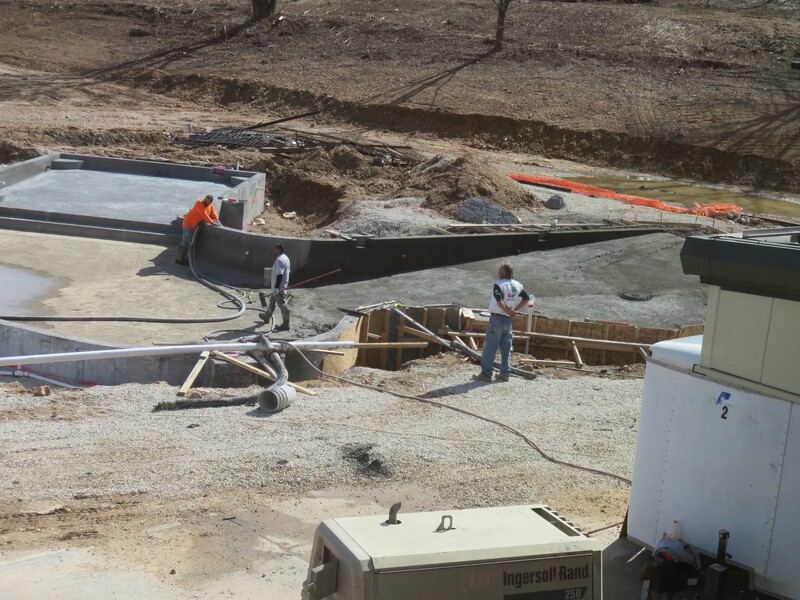 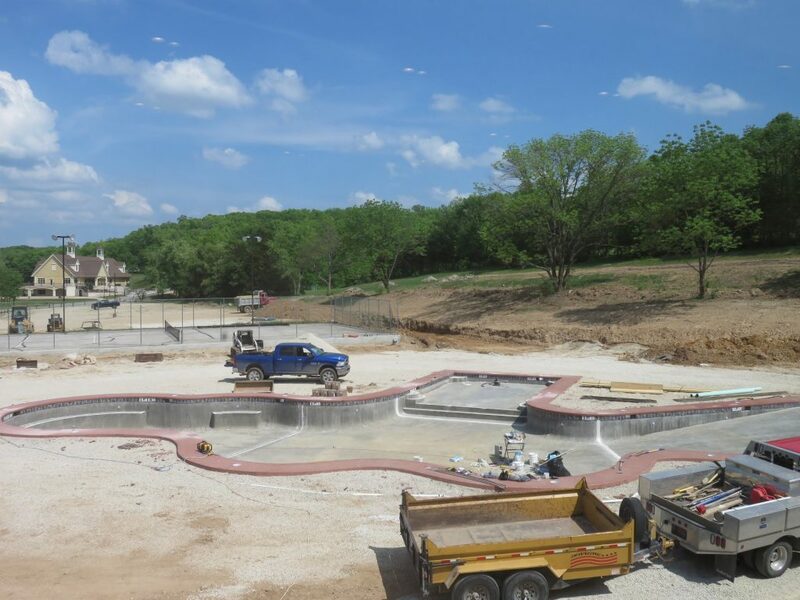 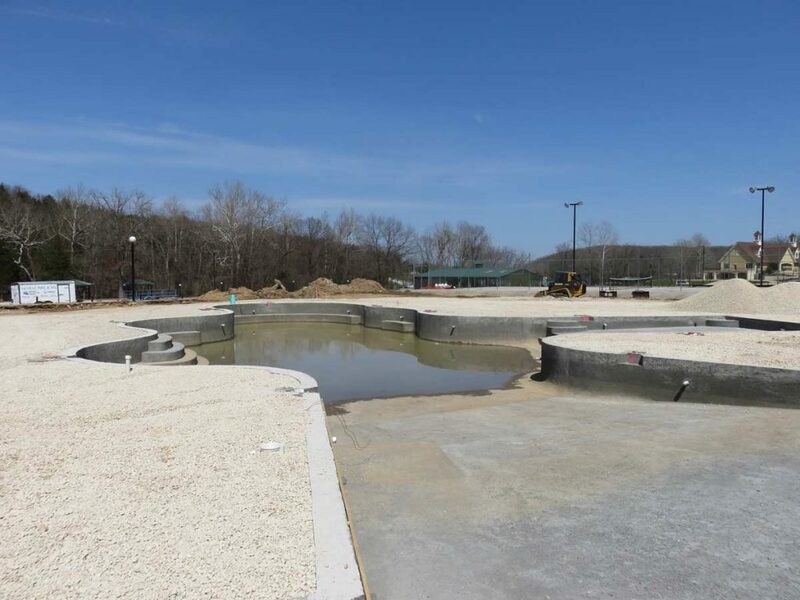 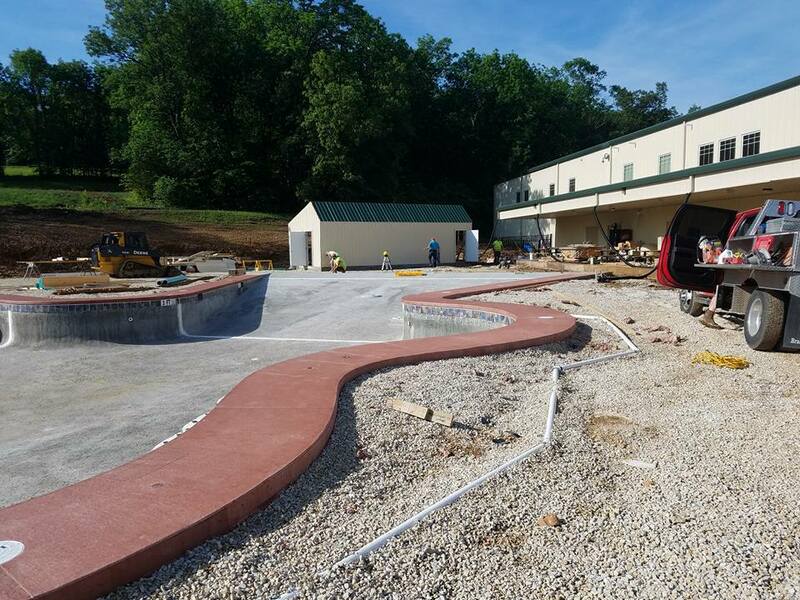 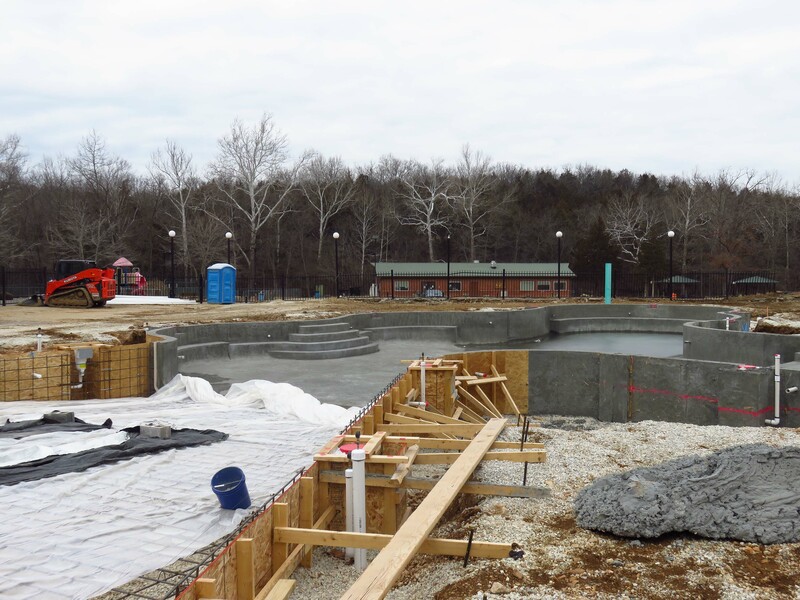 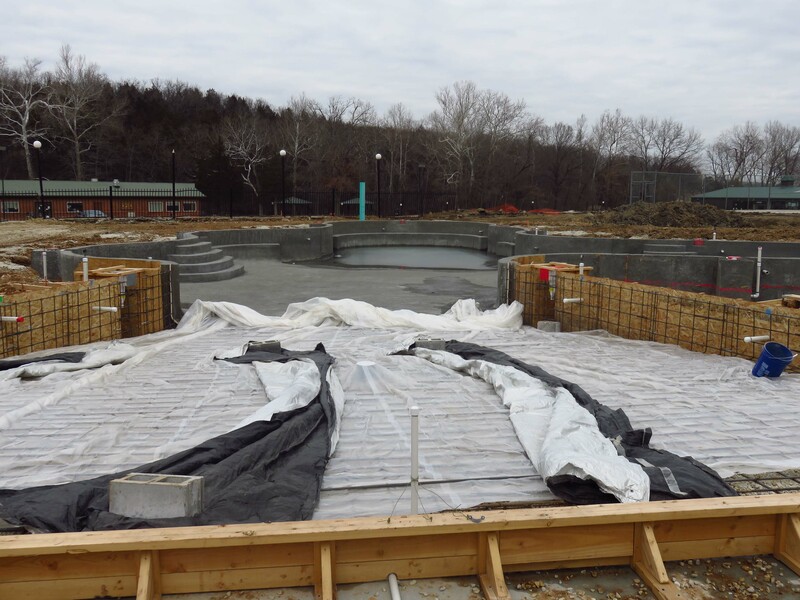 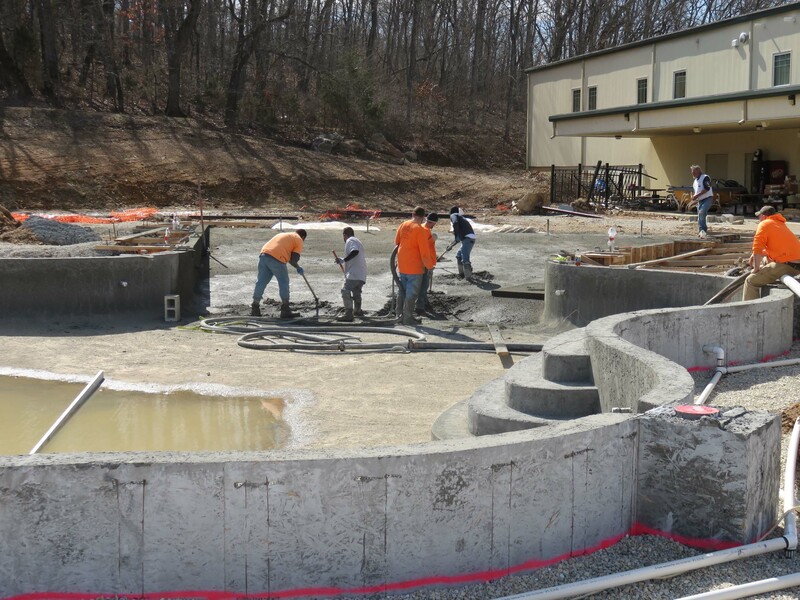 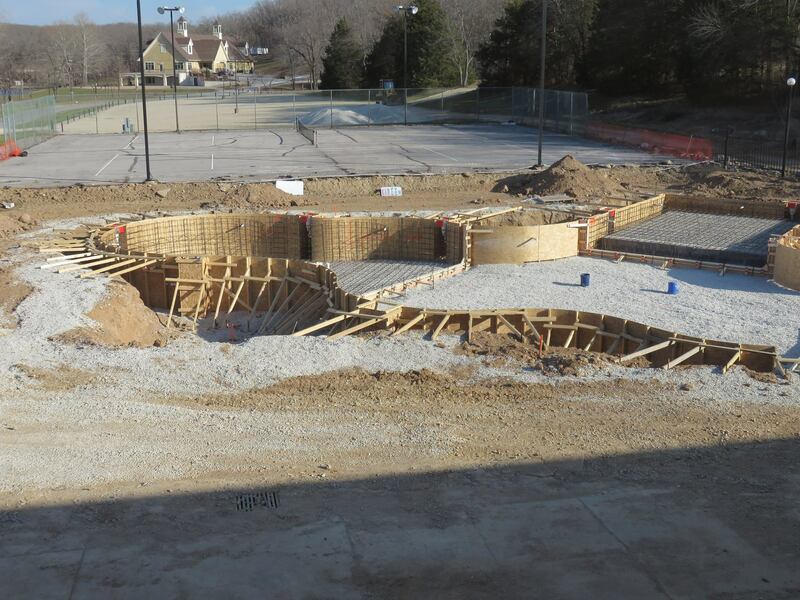 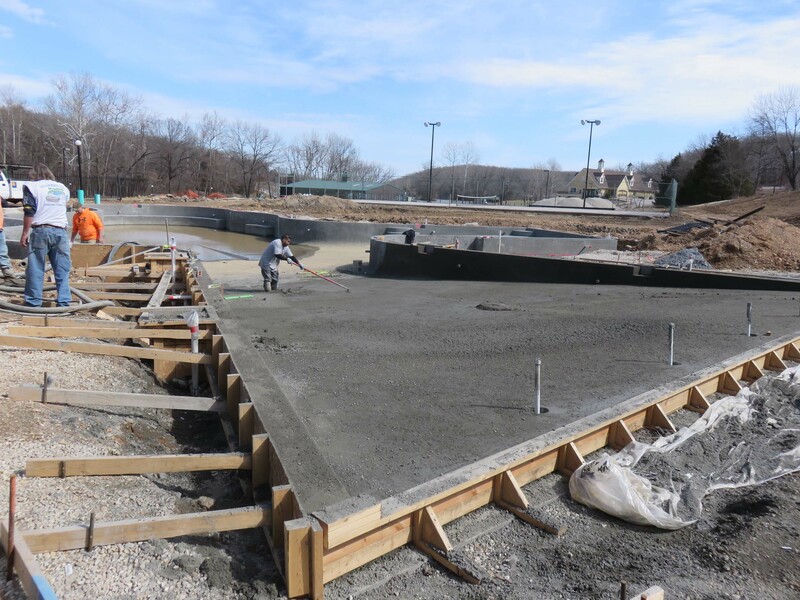 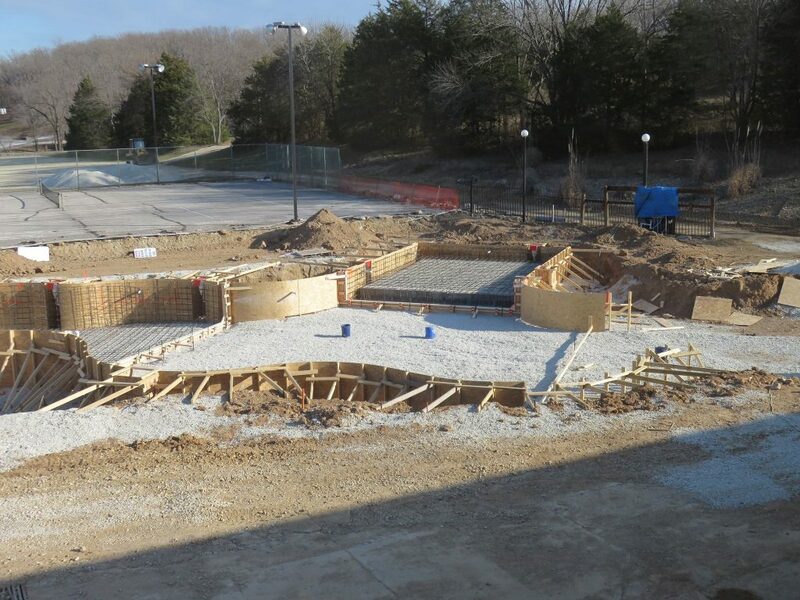 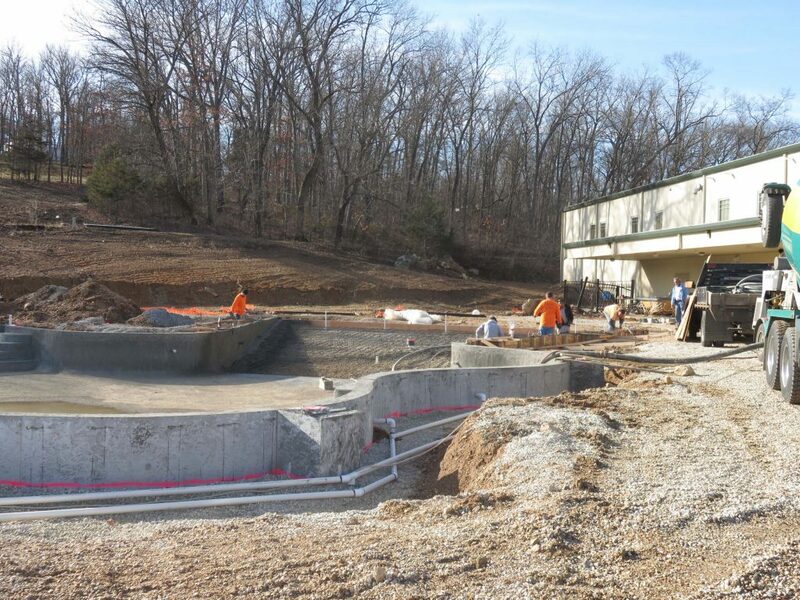 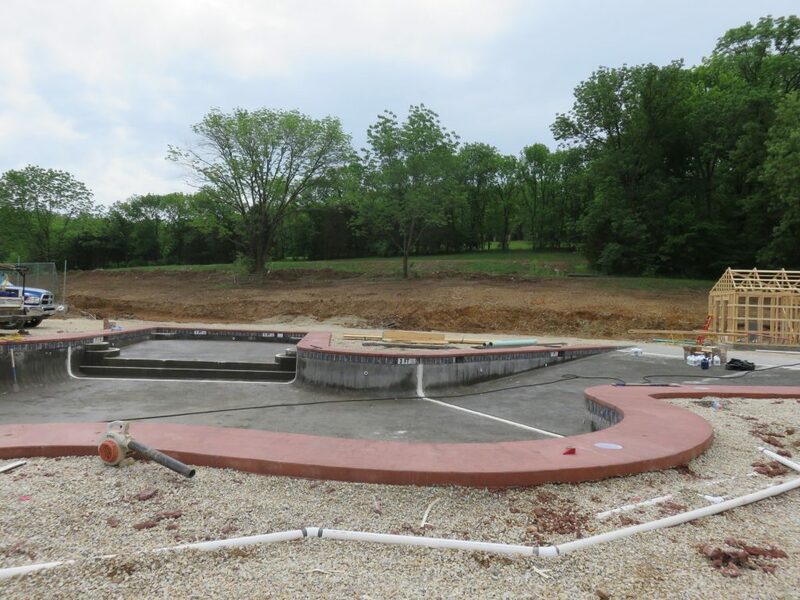 February 5, 2018 - making progress on the new pool. 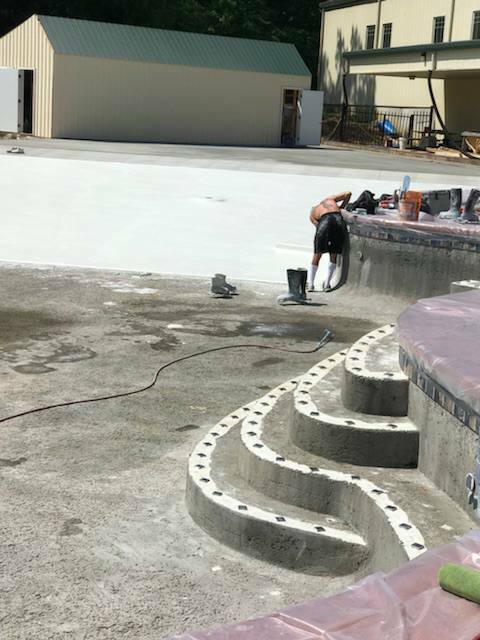 Spraying the concrete has begun! 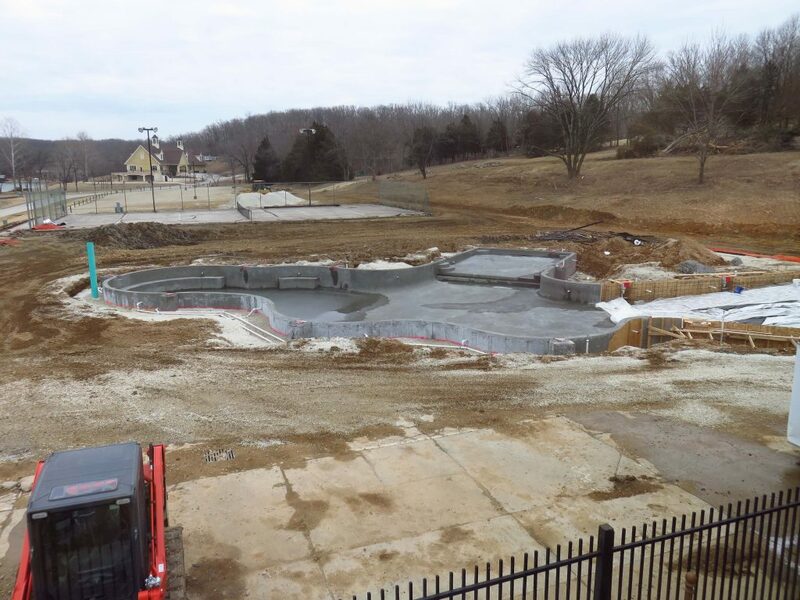 January 9, 2018 - New Year.. New Pool!! 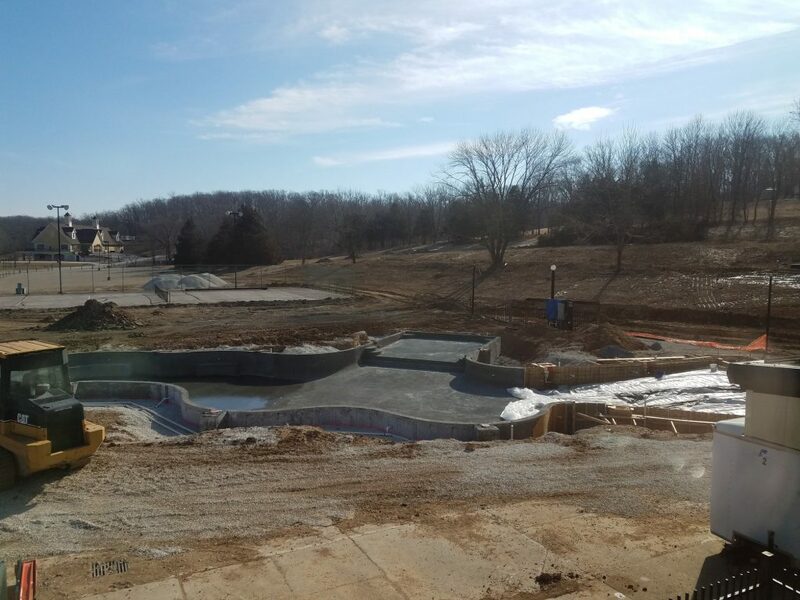 December 11, 2017 - You guessed it! 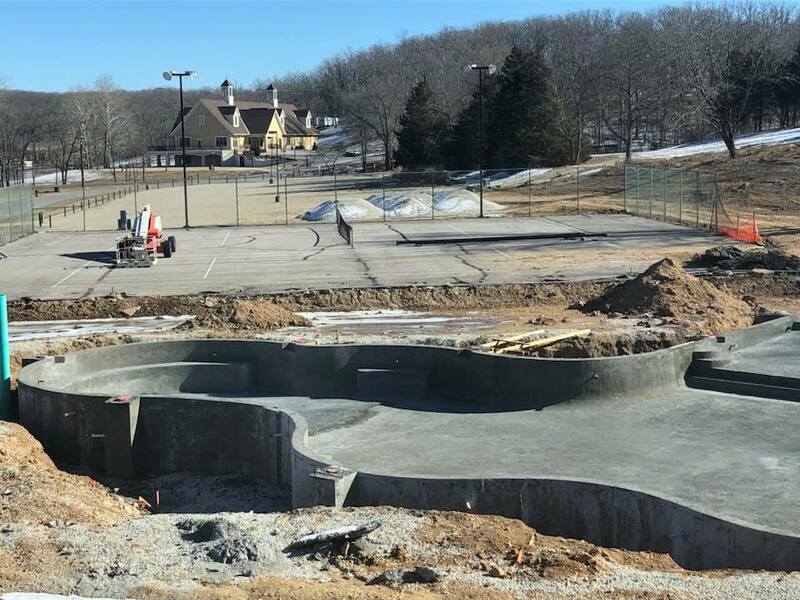 More Progress! 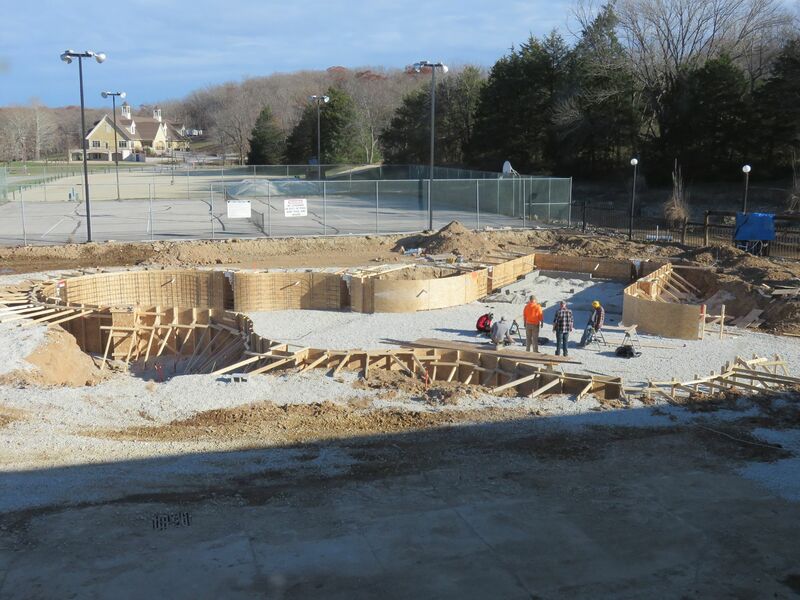 November 29, 2017 - More progress!! 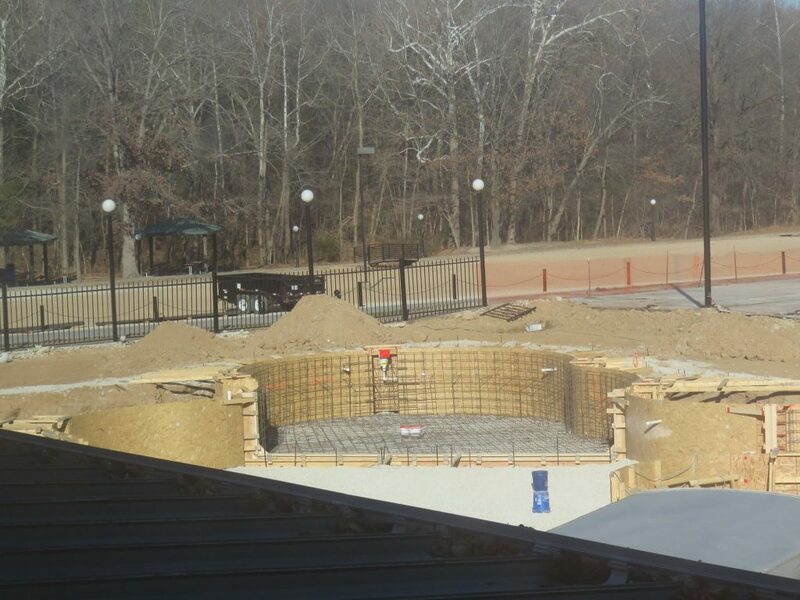 November 21, 2017 - Getting it framed in! 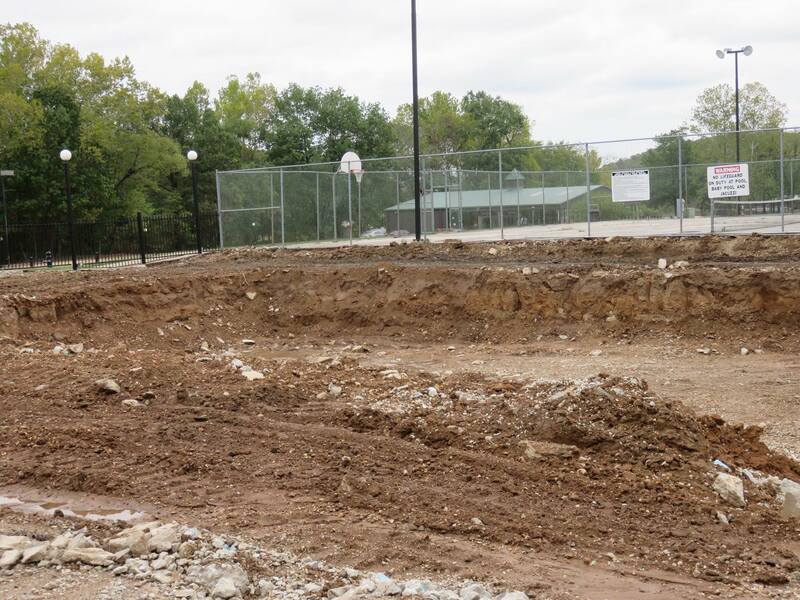 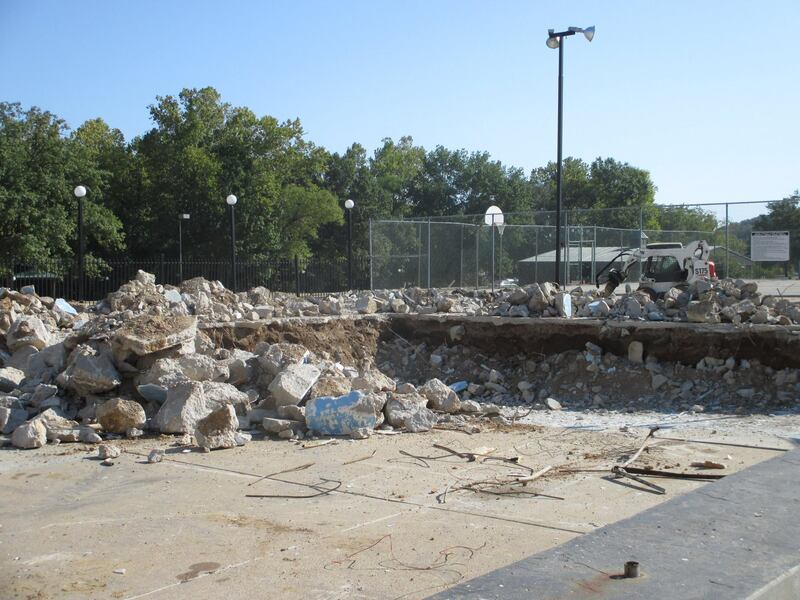 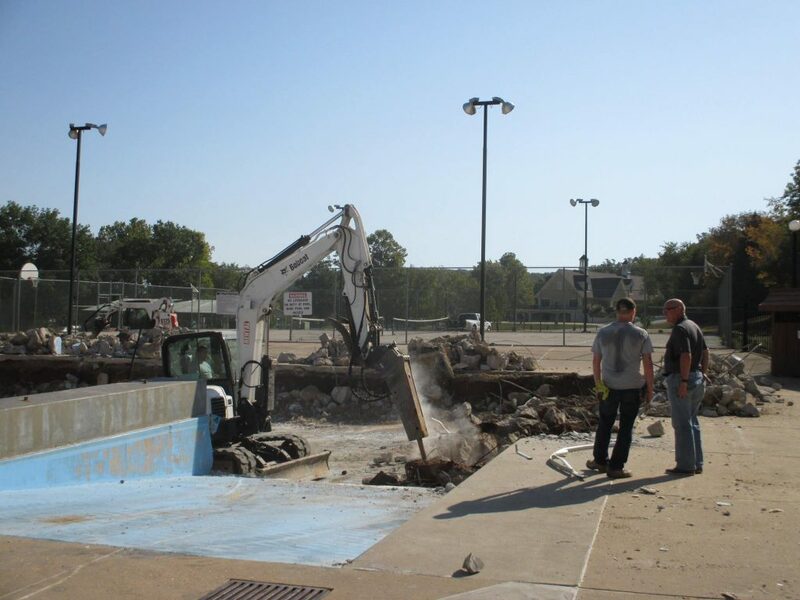 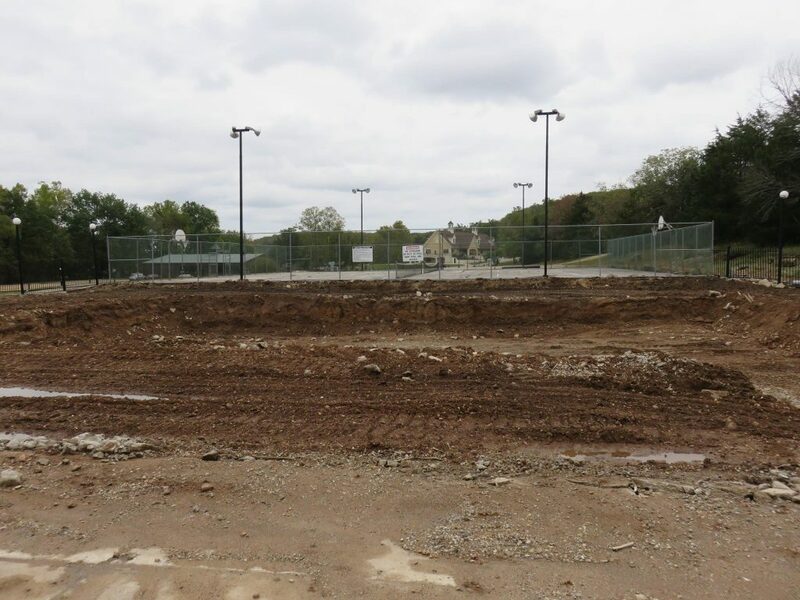 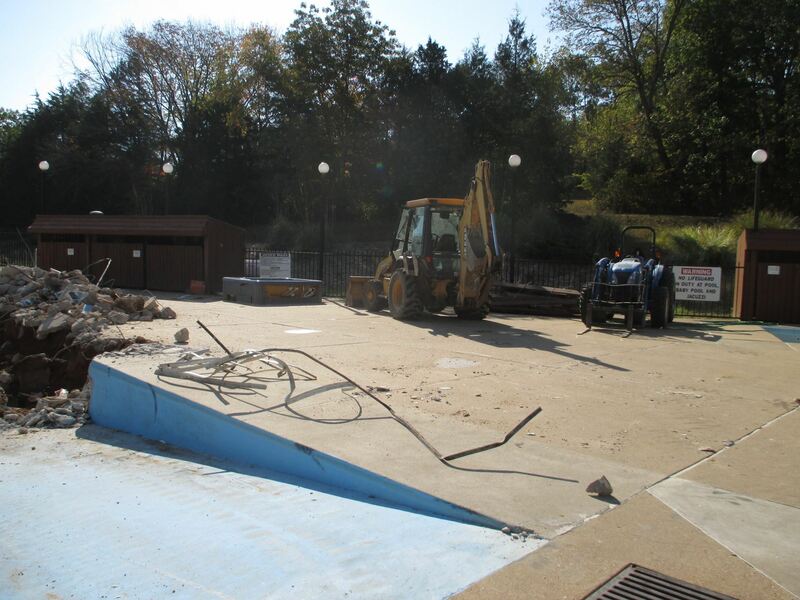 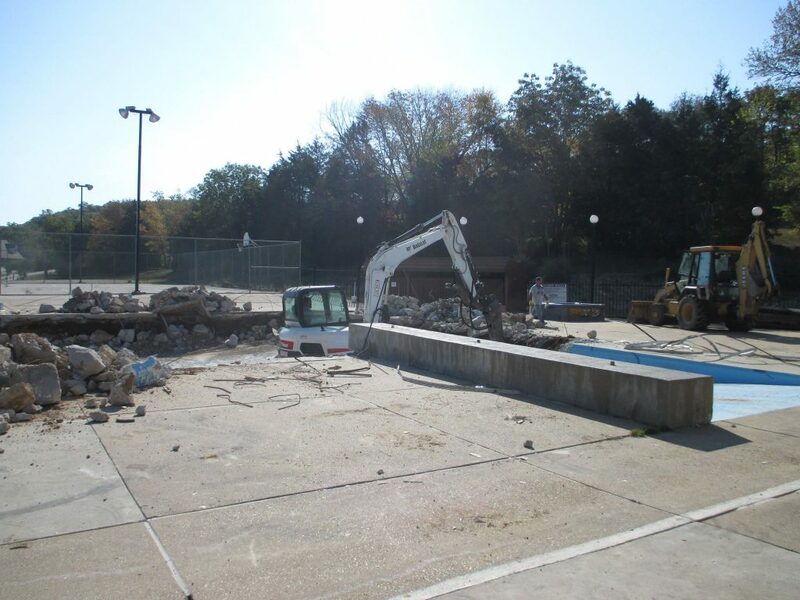 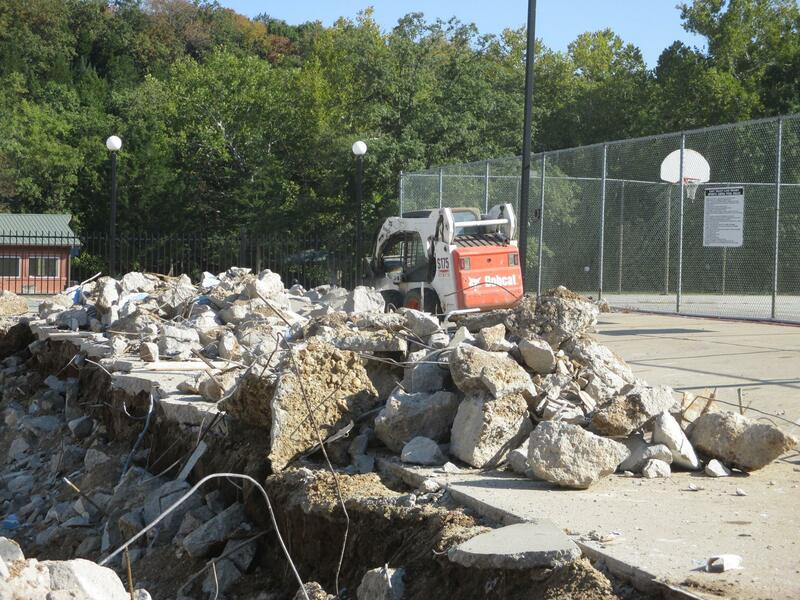 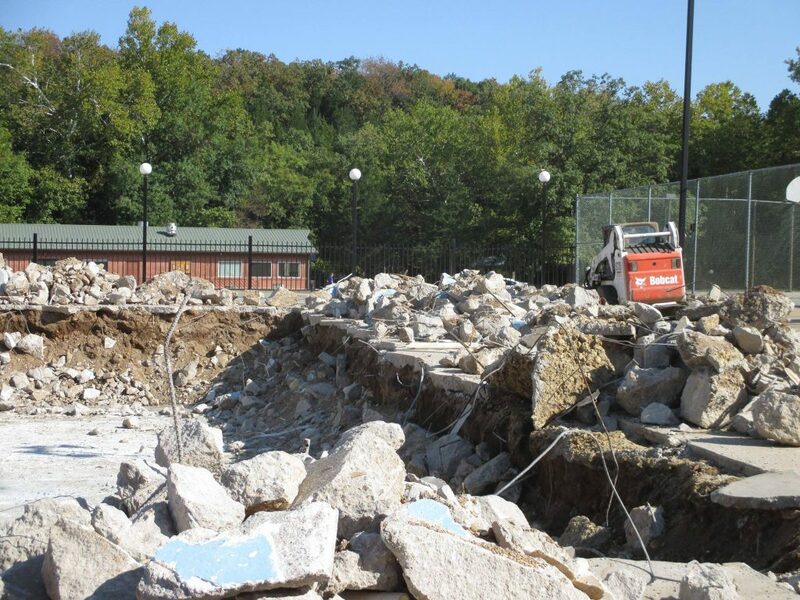 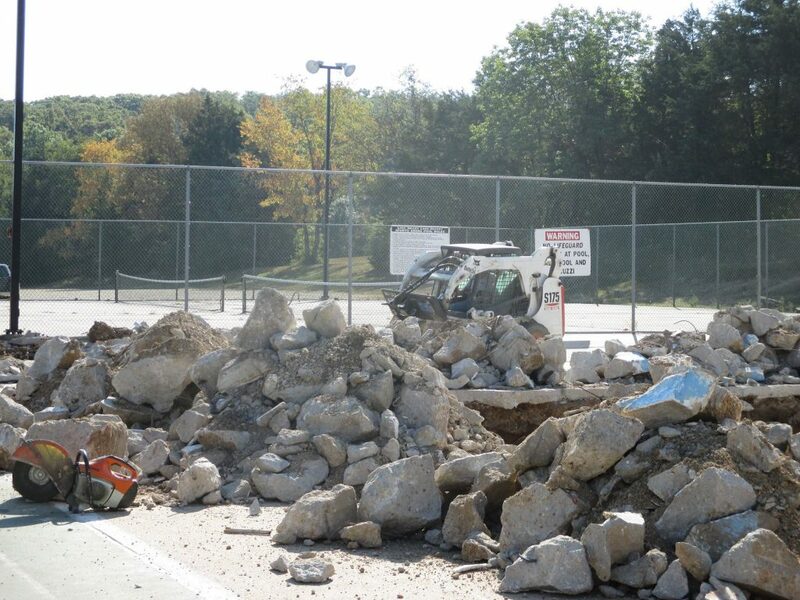 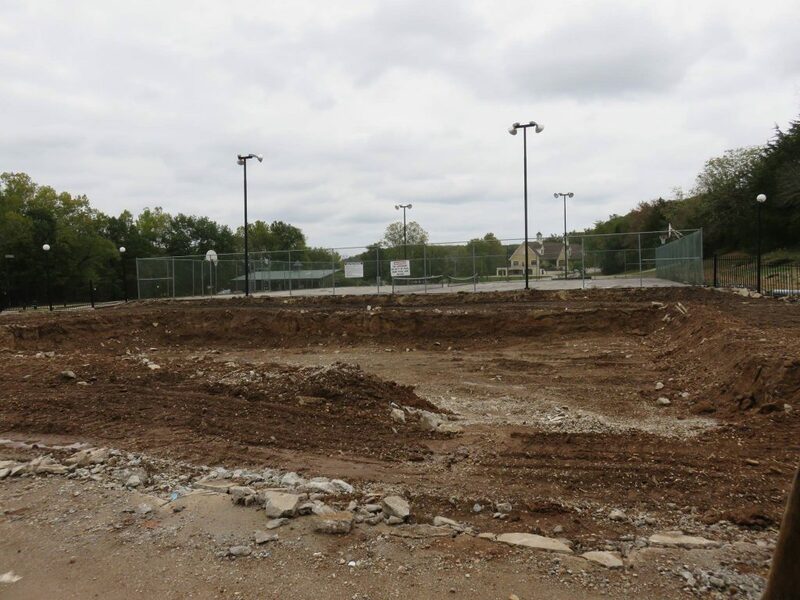 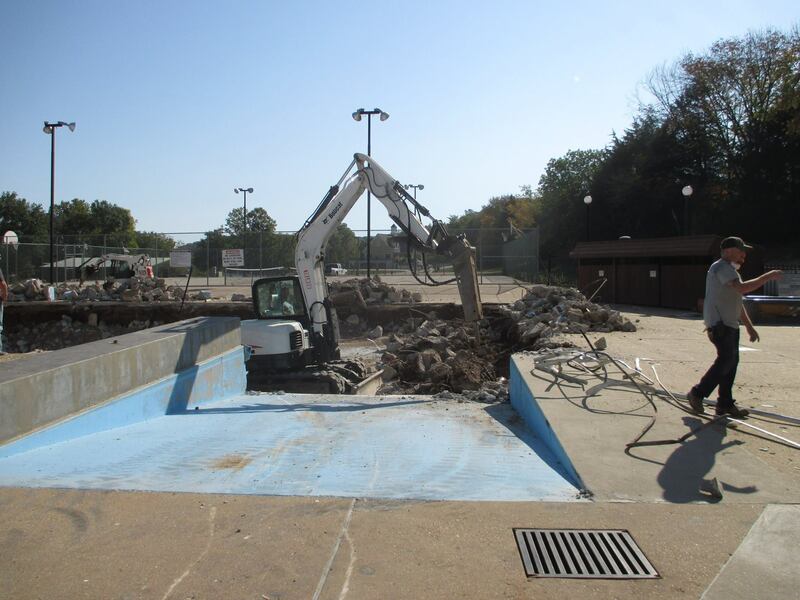 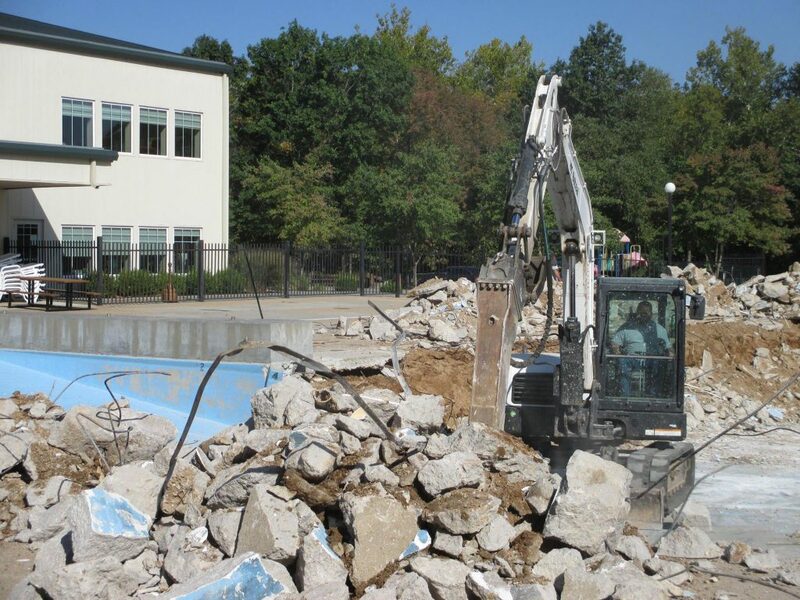 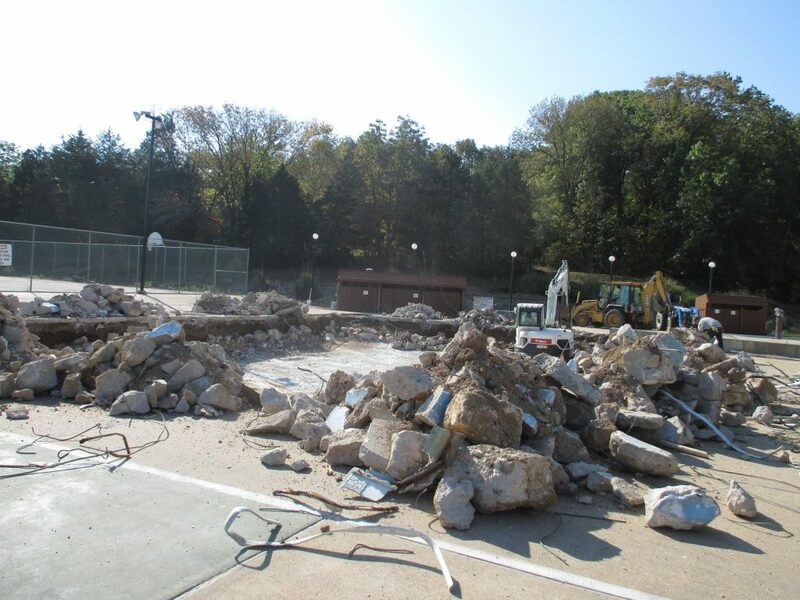 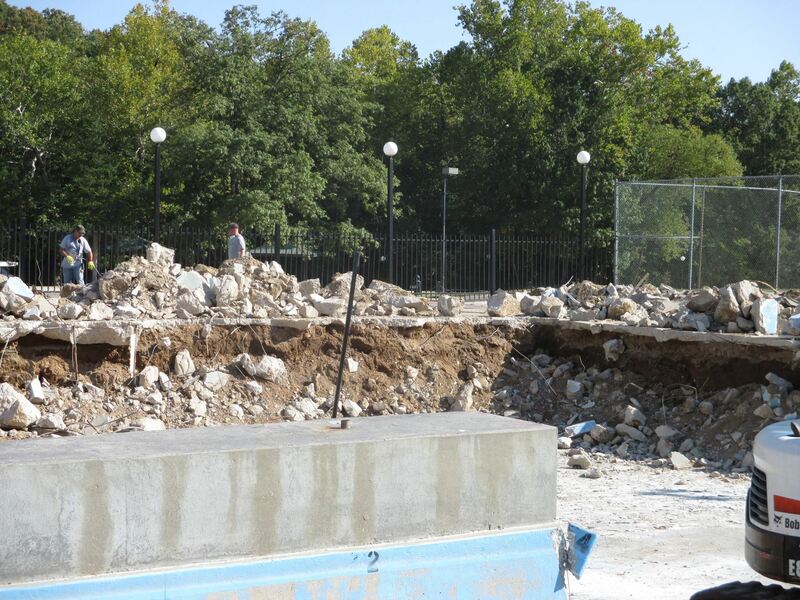 September 22, 2017 - Demolition of the old pool has begun!